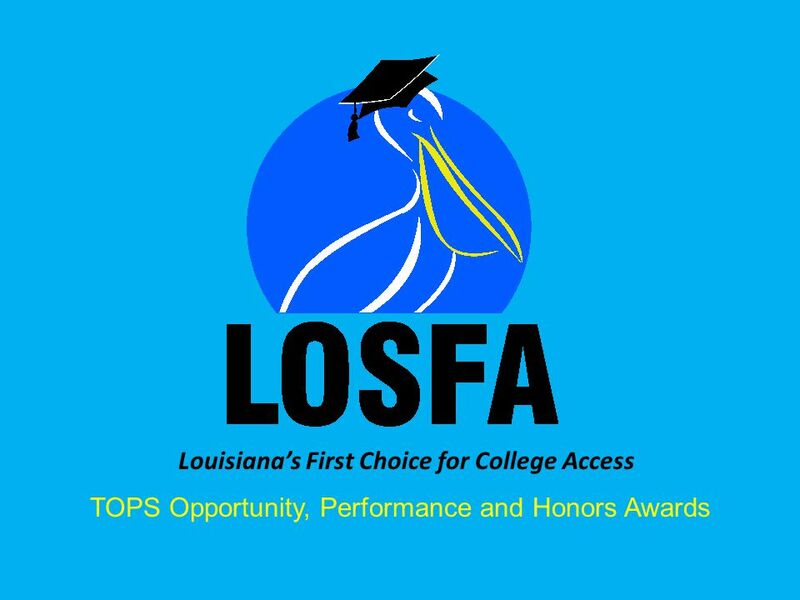 Louisiana’s First Choice for College Access TOPS Opportunity, Performance and Honors Awards. 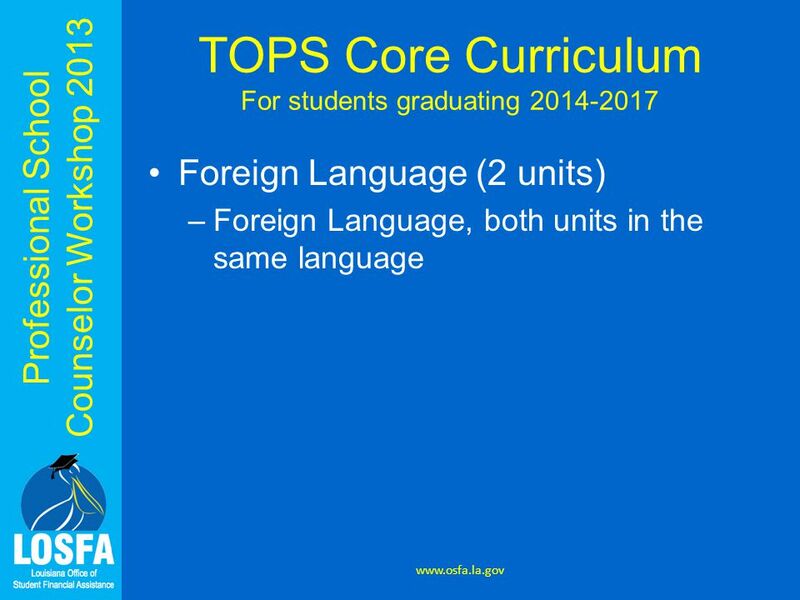 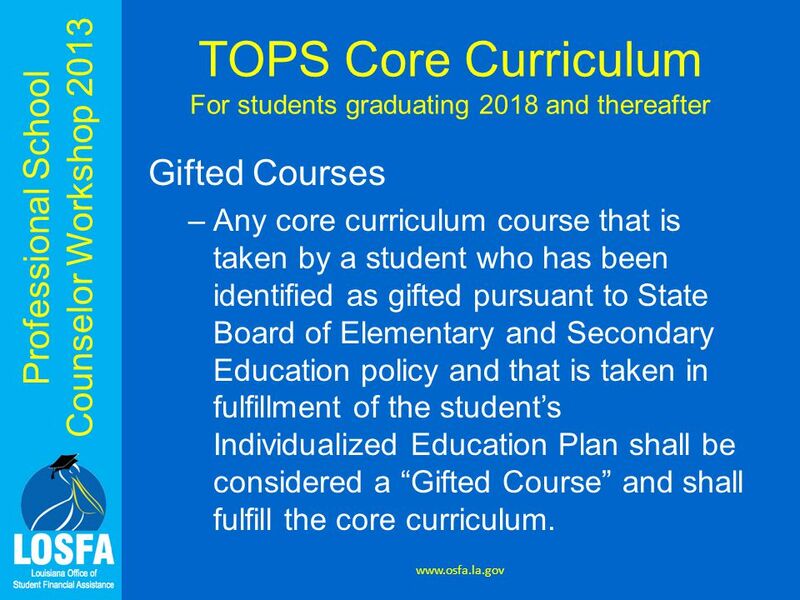 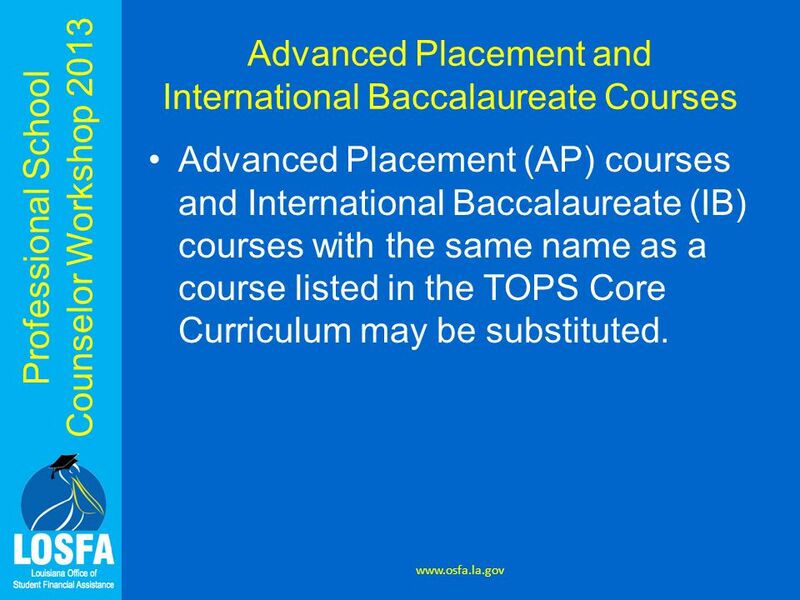 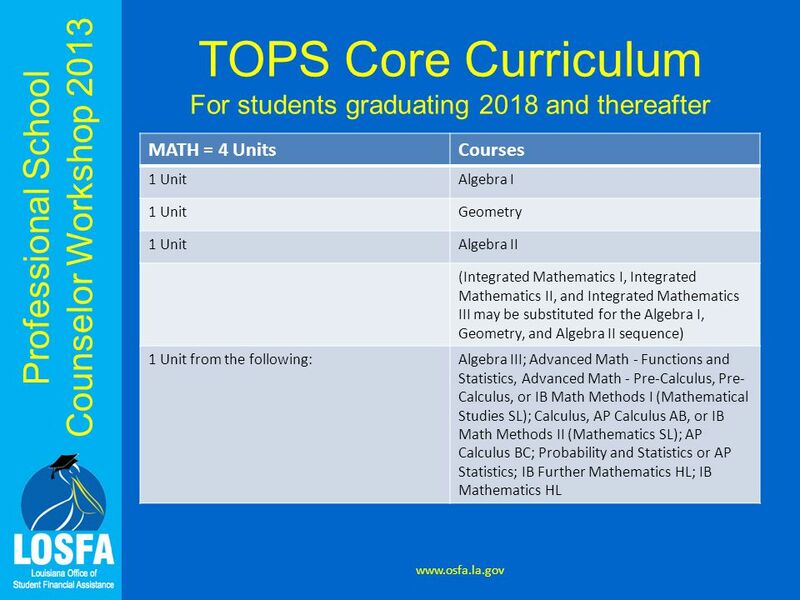 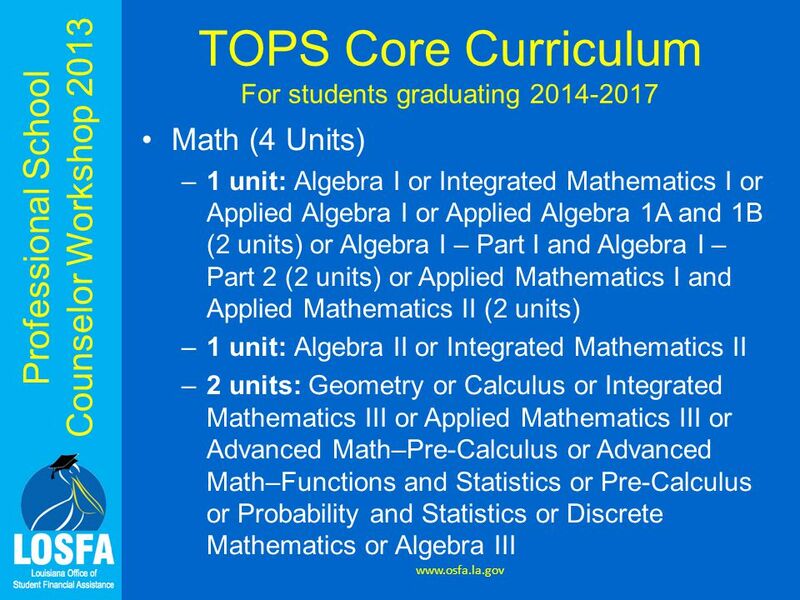 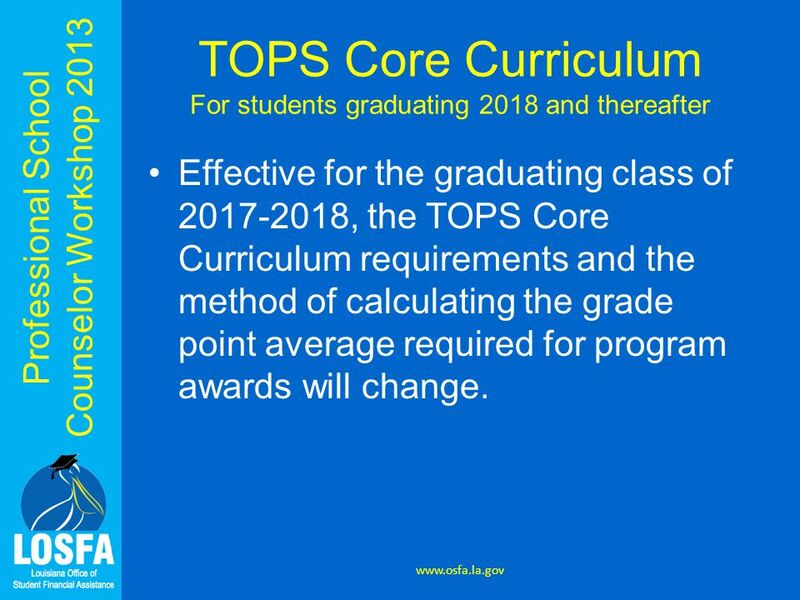 29 Professional School Counselor Workshop 2013 TOPS Core Curriculum For students graduating 2018 and thereafter Beginning with the students entering the 9 th grade in 2014-2015 and graduating in the 2017-2018 school year and thereafter, the calculation of the TOPS Core Curriculum grade point average (GPA) will use a five – (5.00) point scale for grade earned in certain Advanced Placement (AP) courses, International Baccalaureate (IB) courses, Gifted Courses, and Dual Enrollment courses used to complete the TOPS Core Curriculum. 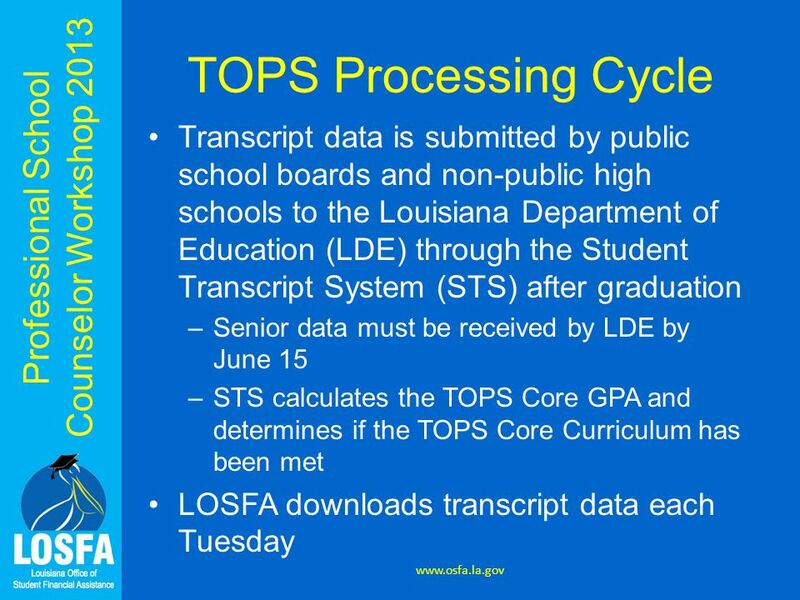 At this time, BESE and the Board of Regents have not designated the courses that will be calculated on the five- (5.00) scale 1. 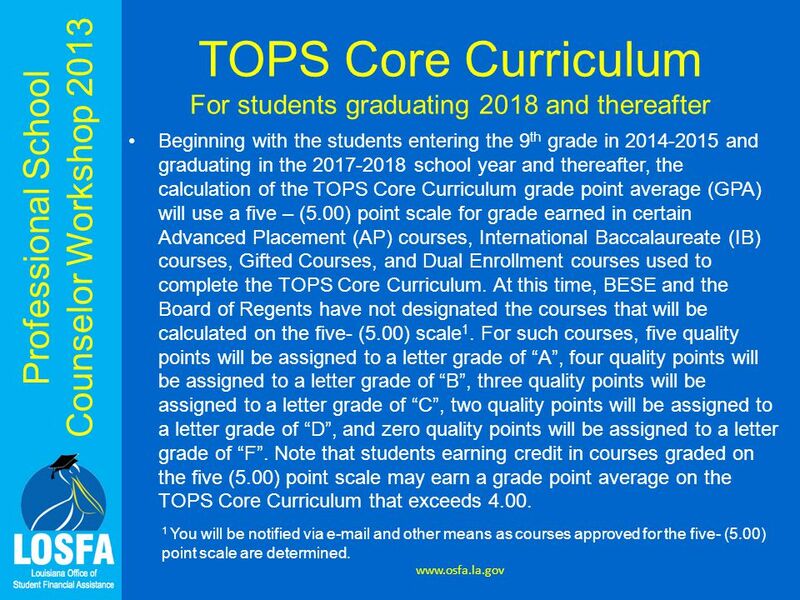 For such courses, five quality points will be assigned to a letter grade of “A”, four quality points will be assigned to a letter grade of “B”, three quality points will be assigned to a letter grade of “C”, two quality points will be assigned to a letter grade of “D”, and zero quality points will be assigned to a letter grade of “F”. 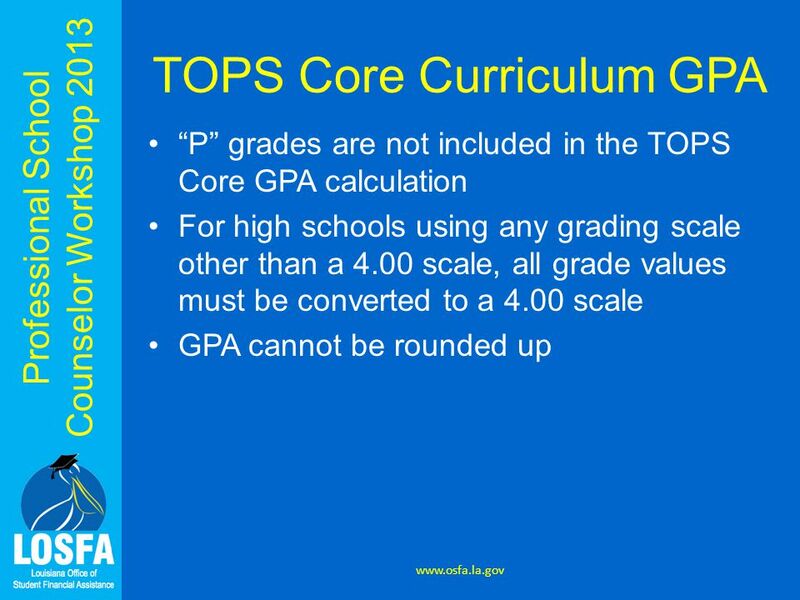 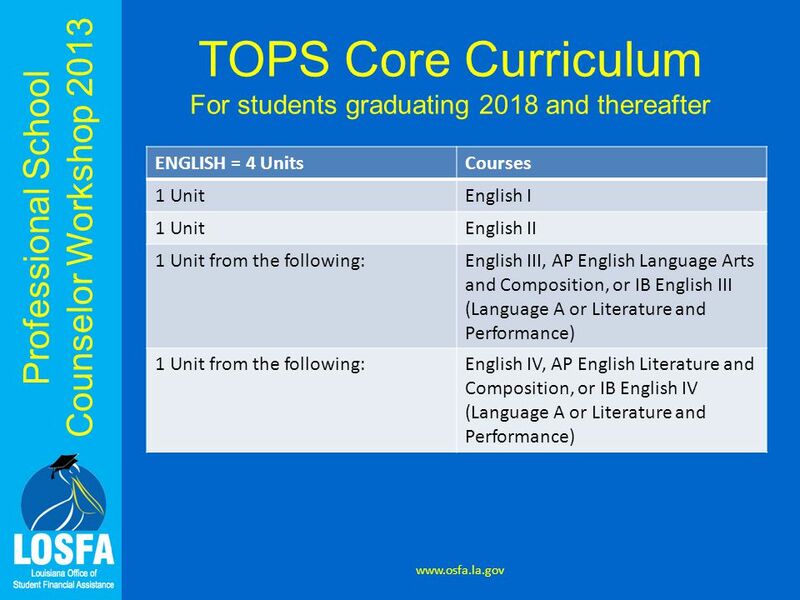 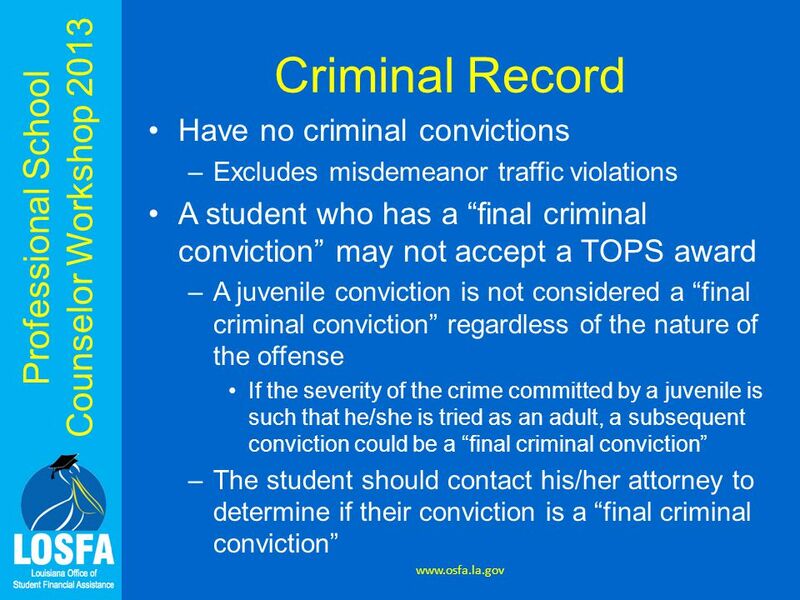 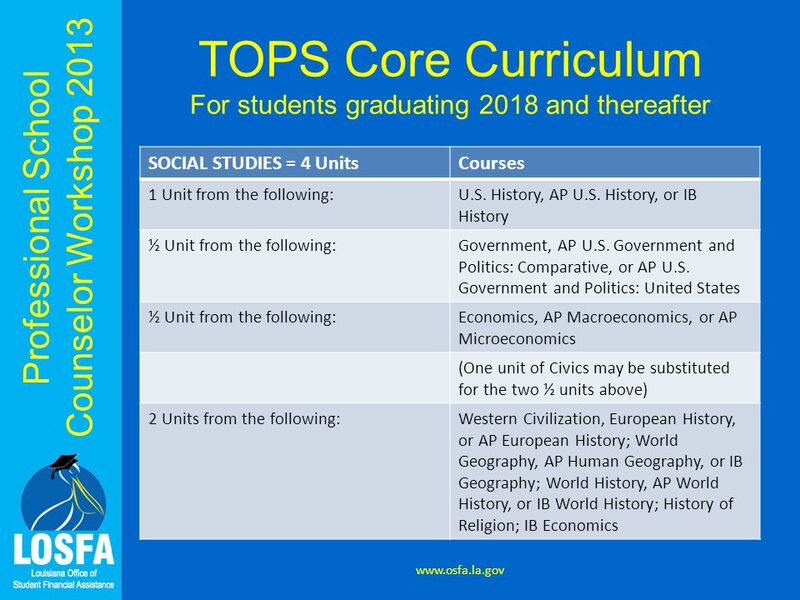 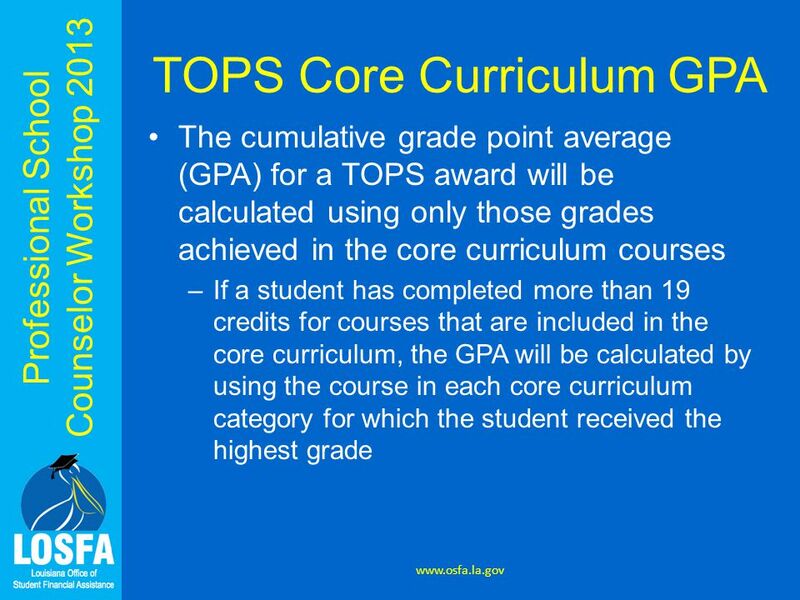 Note that students earning credit in courses graded on the five (5.00) point scale may earn a grade point average on the TOPS Core Curriculum that exceeds 4.00. www.osfa.la.gov 1 You will be notified via e-mail and other means as courses approved for the five- (5.00) point scale are determined. 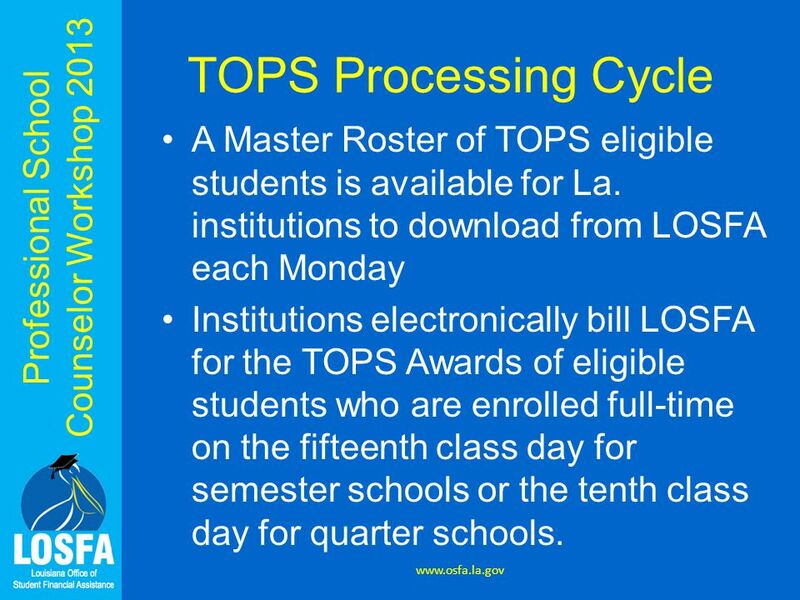 56 Professional School Counselor Workshop 2013 Application Deadlines for 2014 Graduates www.osfa.la.gov The only deadline for receipt of a TOPS application is July 1 following the one year anniversary of high school graduation. 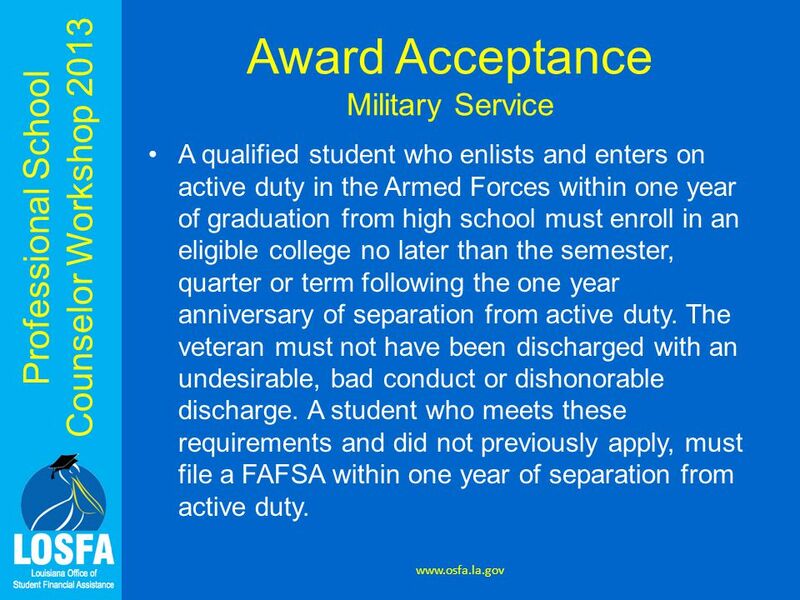 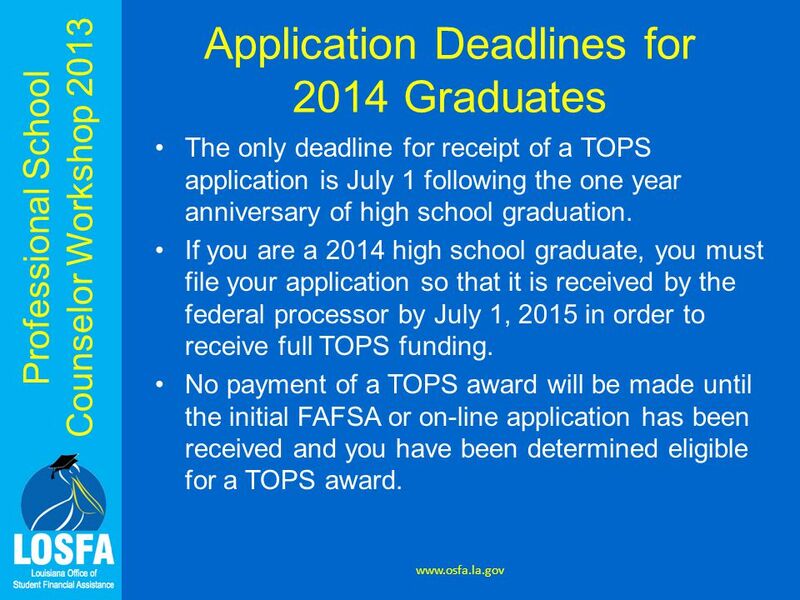 If you are a 2014 high school graduate, you must file your application so that it is received by the federal processor by July 1, 2015 in order to receive full TOPS funding. 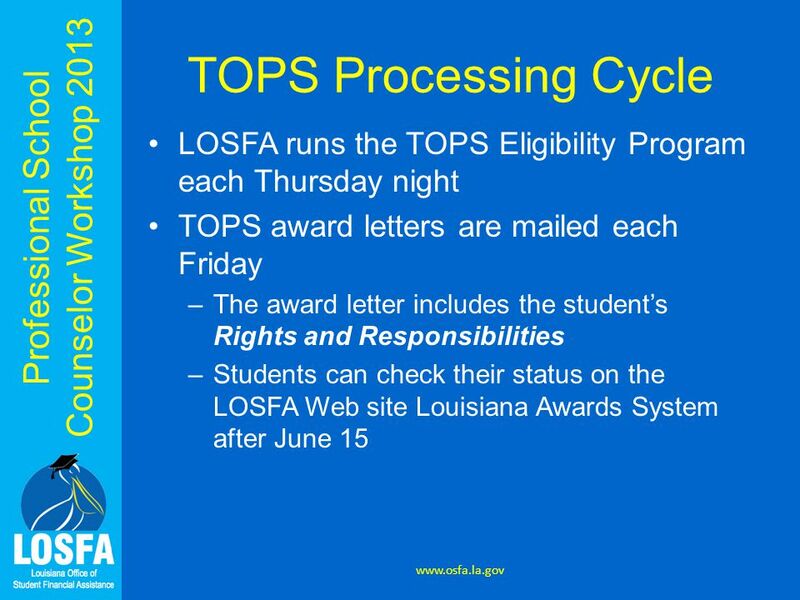 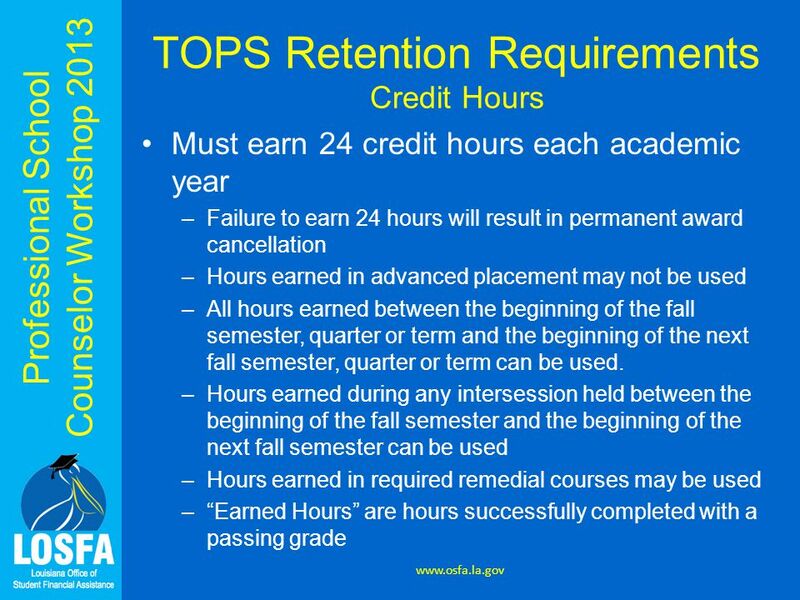 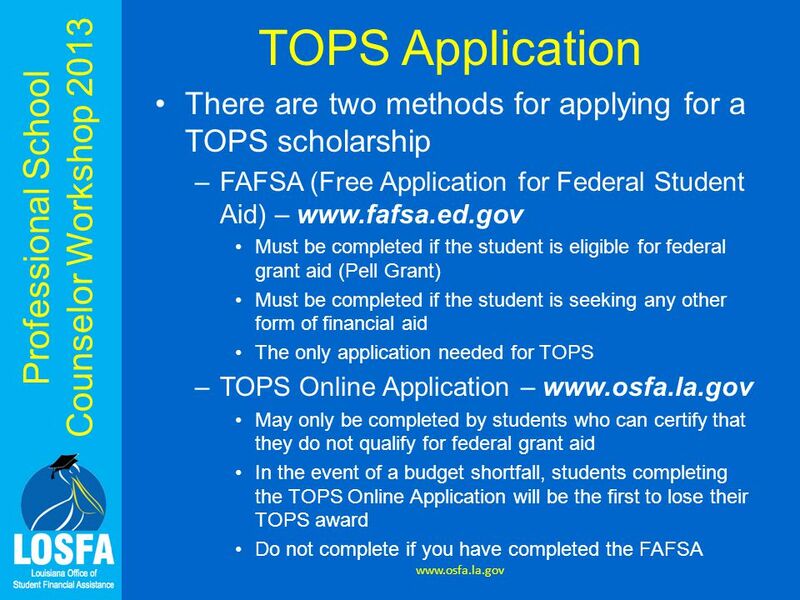 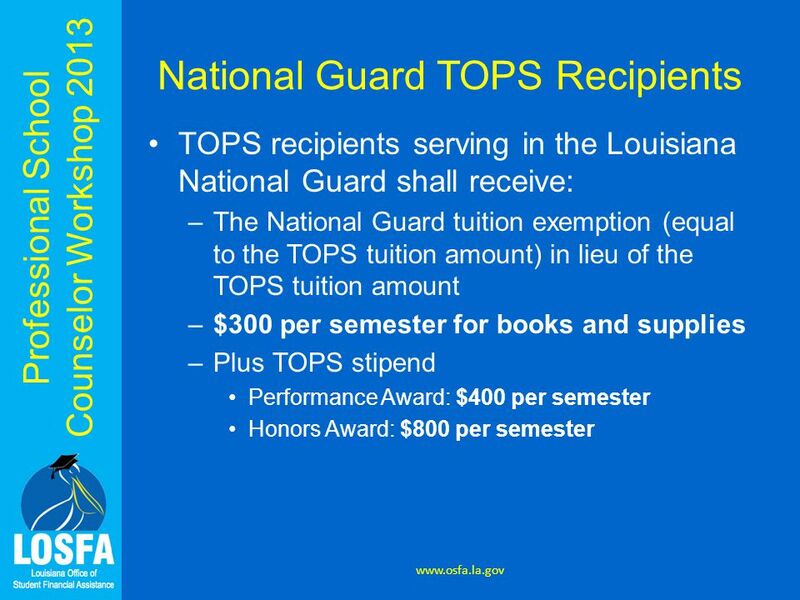 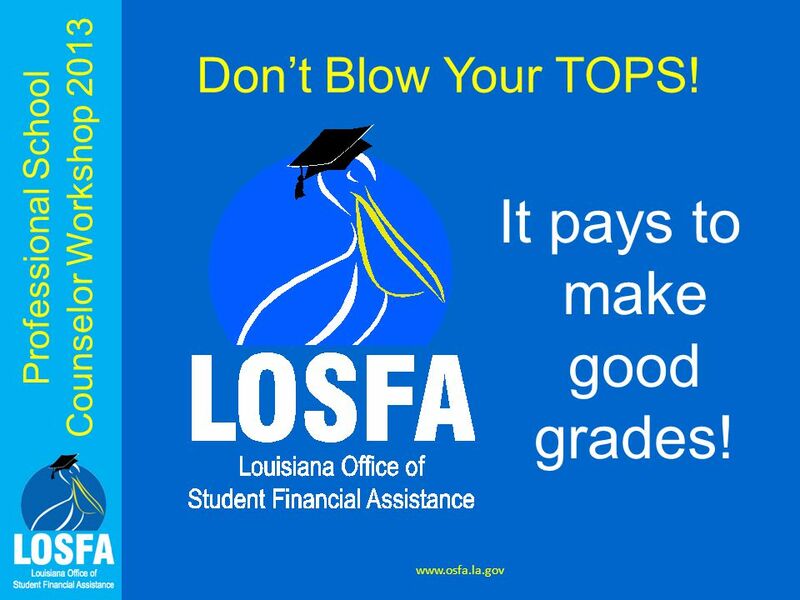 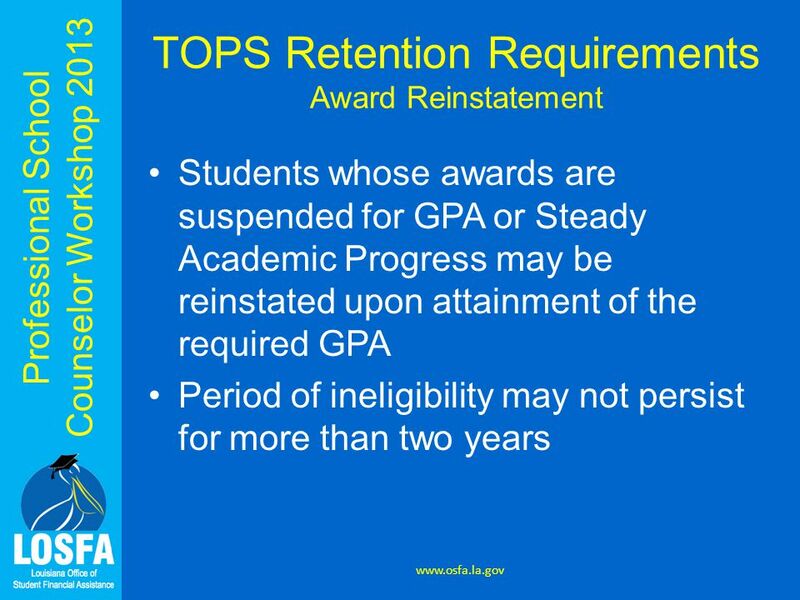 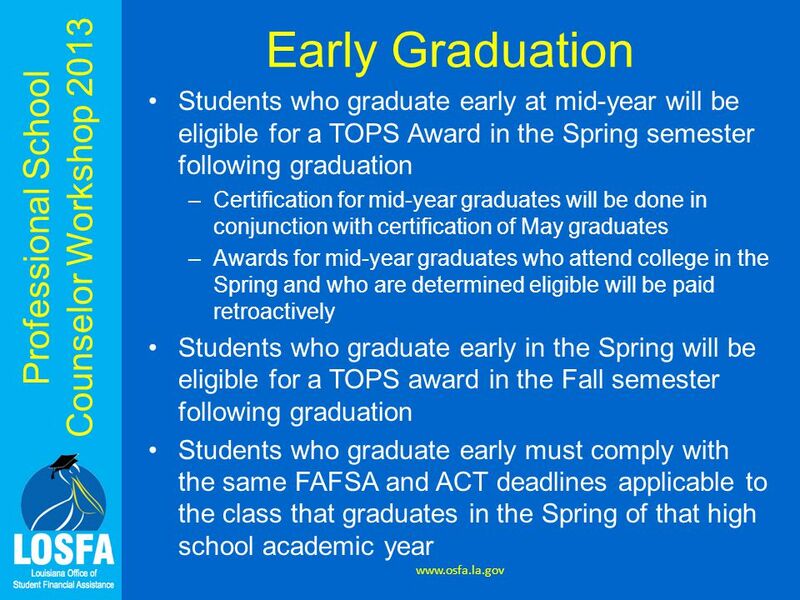 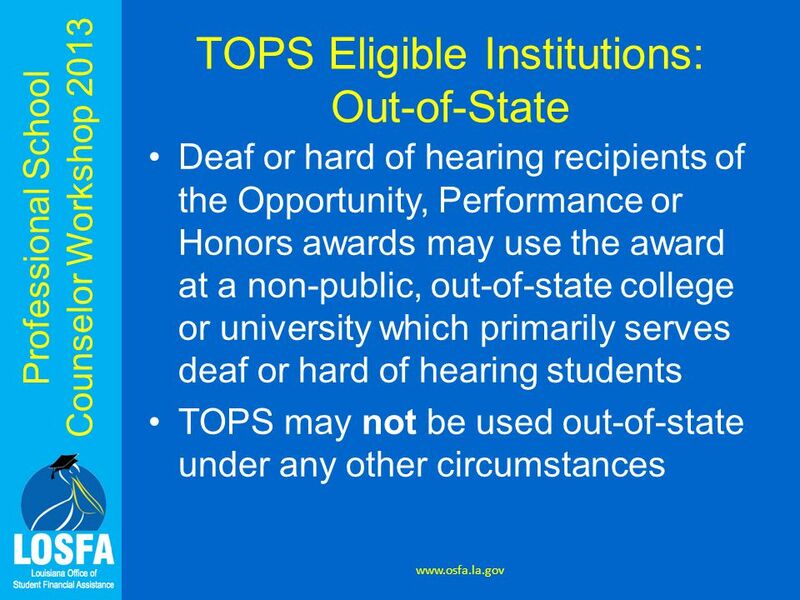 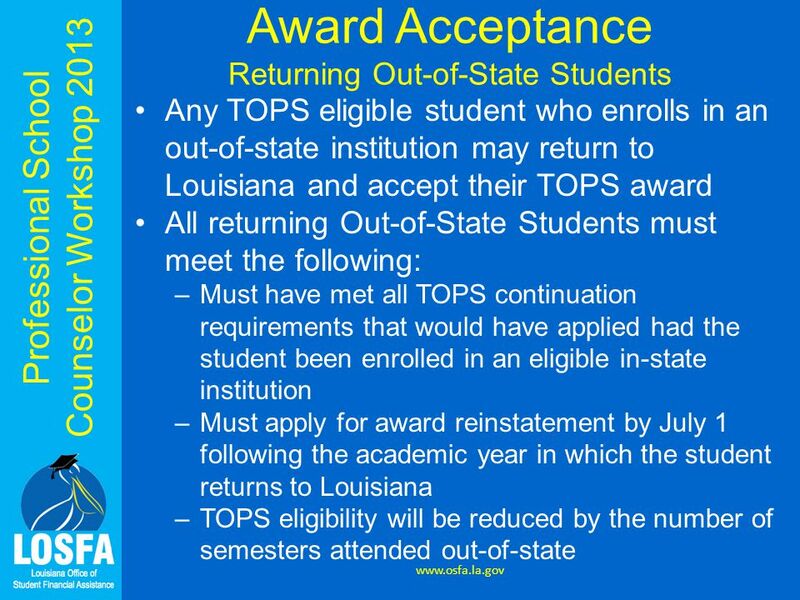 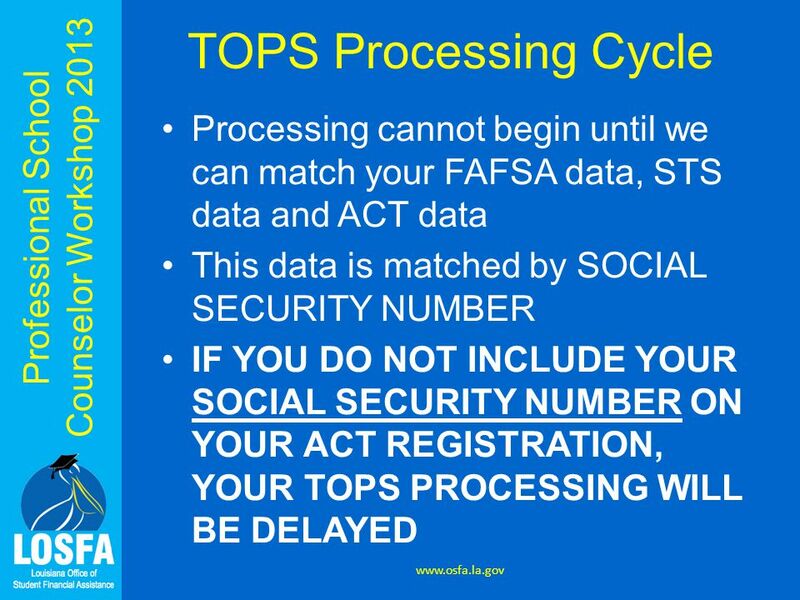 No payment of a TOPS award will be made until the initial FAFSA or on-line application has been received and you have been determined eligible for a TOPS award. 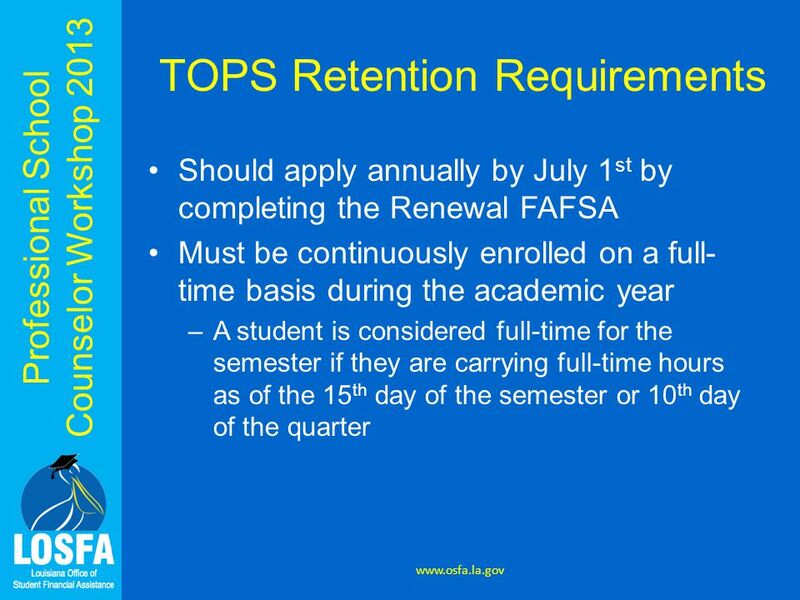 57 Professional School Counselor Workshop 2013 Application Deadlines for 2014 Graduates www.osfa.la.gov If your initial FAFSA or on-line application is received after July 1 immediately following your graduation from high school, the payment of your TOPS award could be delayed depending on the date your application is received and the date you enroll for the first time as a full time student in an eligible college or university. 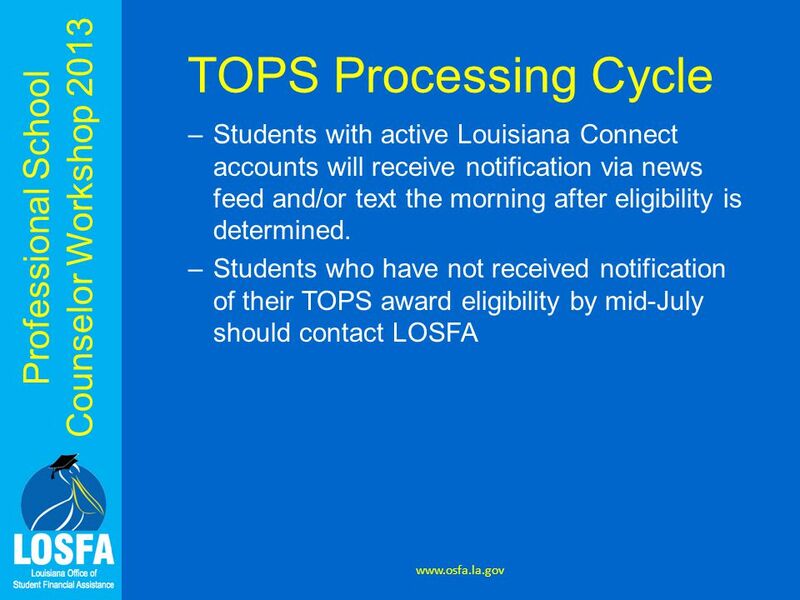 If you enroll for the first time as a full time student before your FAFSA or on-line application is received, you must meet the TOPS Continuation Eligibility Requirements to receive payments of your TOPS award after the first semester, quarter or term of your full time enrollment at an eligible college or university. 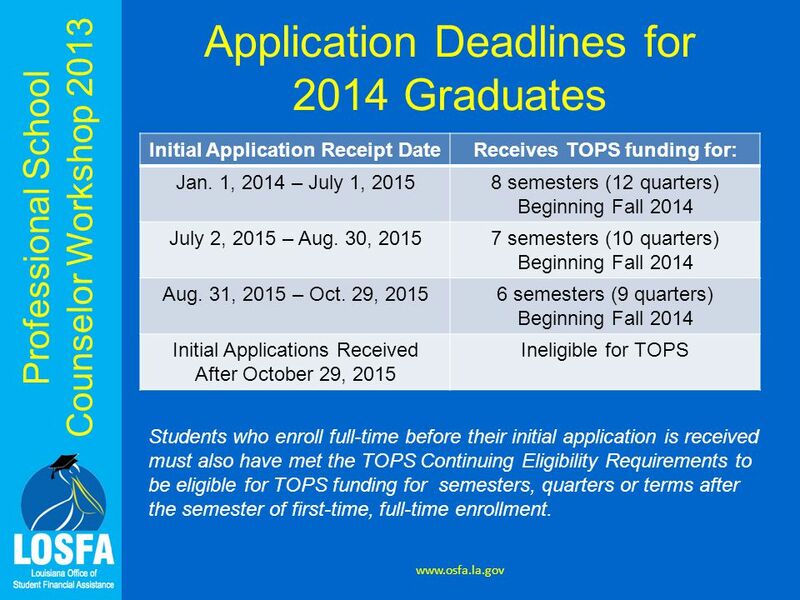 58 Professional School Counselor Workshop 2013 Application Deadlines for 2014 Graduates www.osfa.la.gov If you are a 2014 high school graduate and your application is received from July 2, 2015 through Aug. 30, 2015, you will be eligible to receive seven semesters of TOPS funding beginning with the 2014- 2015 academic year. 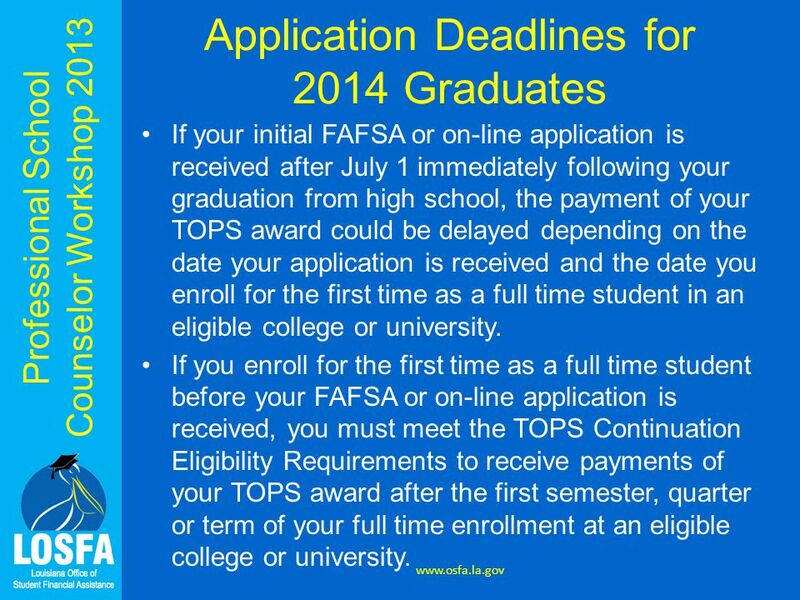 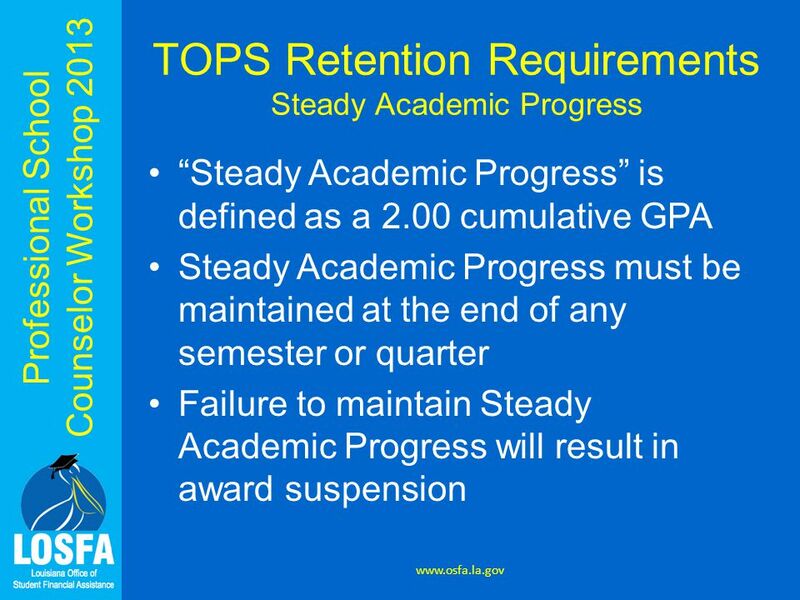 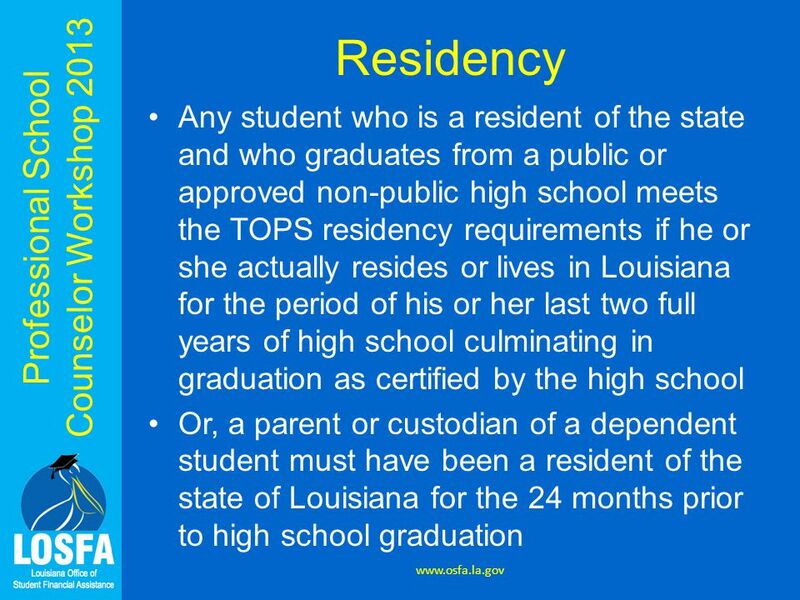 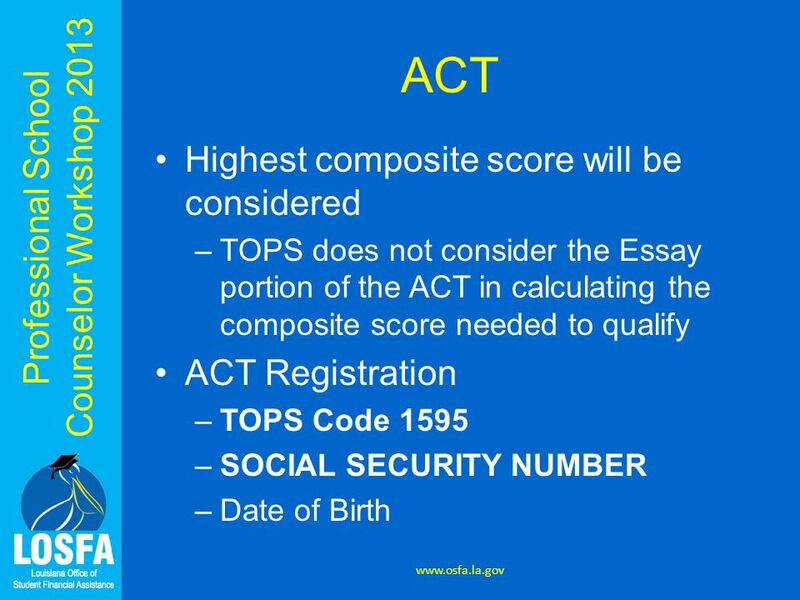 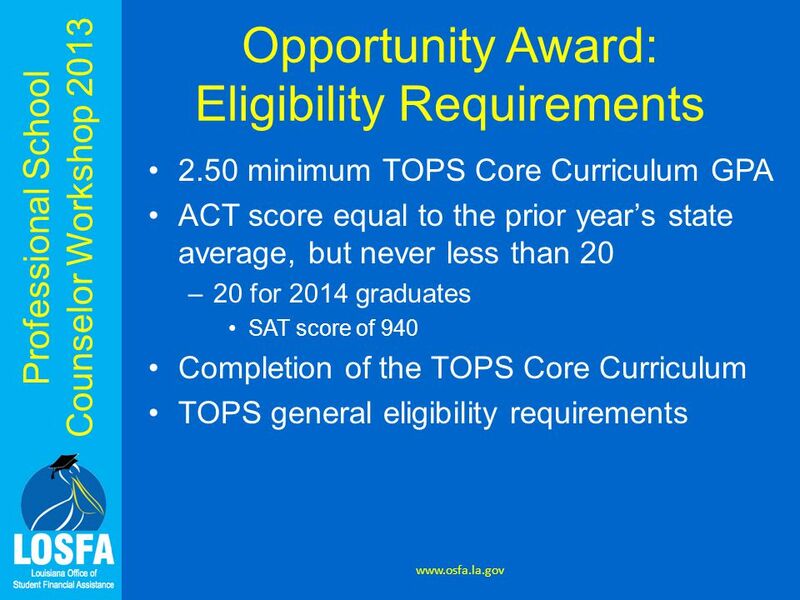 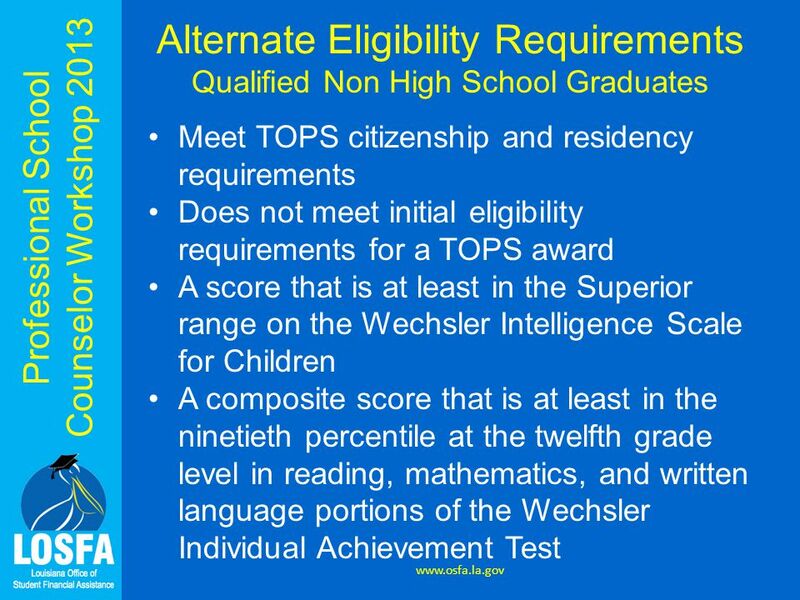 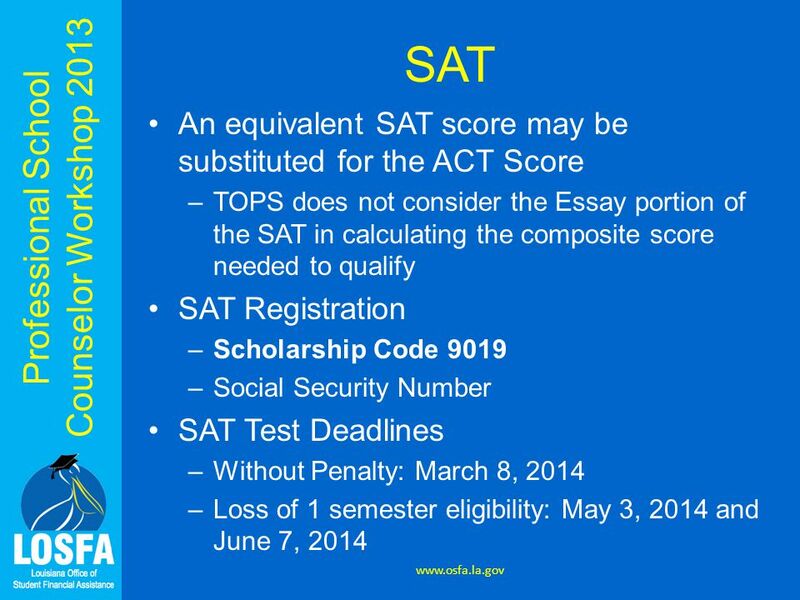 You must also meet TOPS Continuing Eligibility Requirements if you attend college during the 2014-2015 academic year. 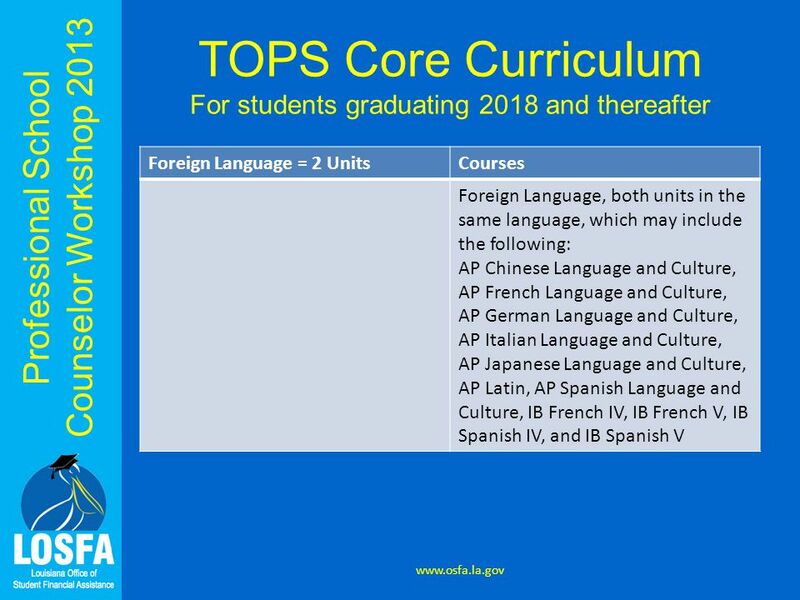 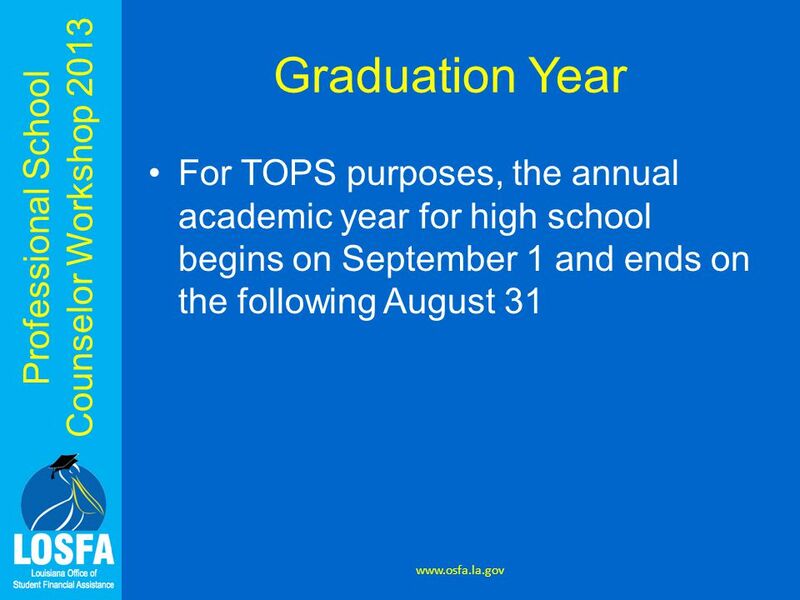 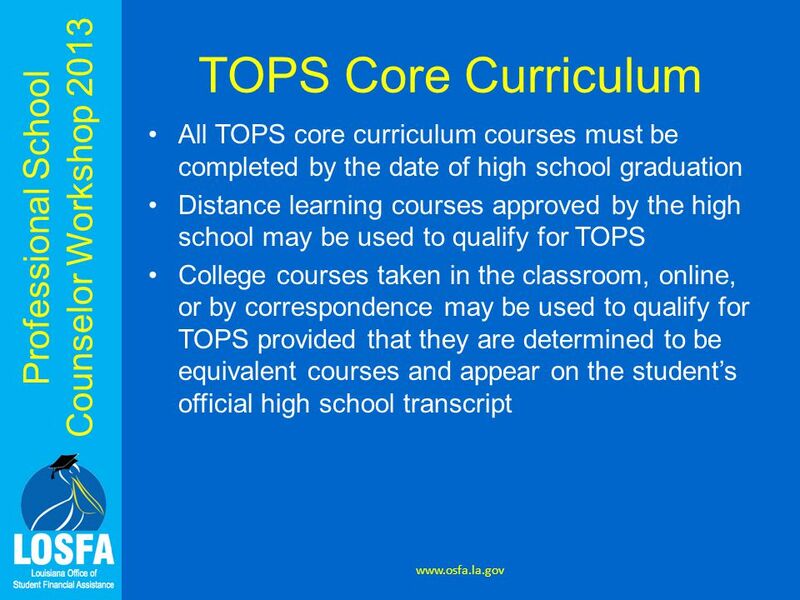 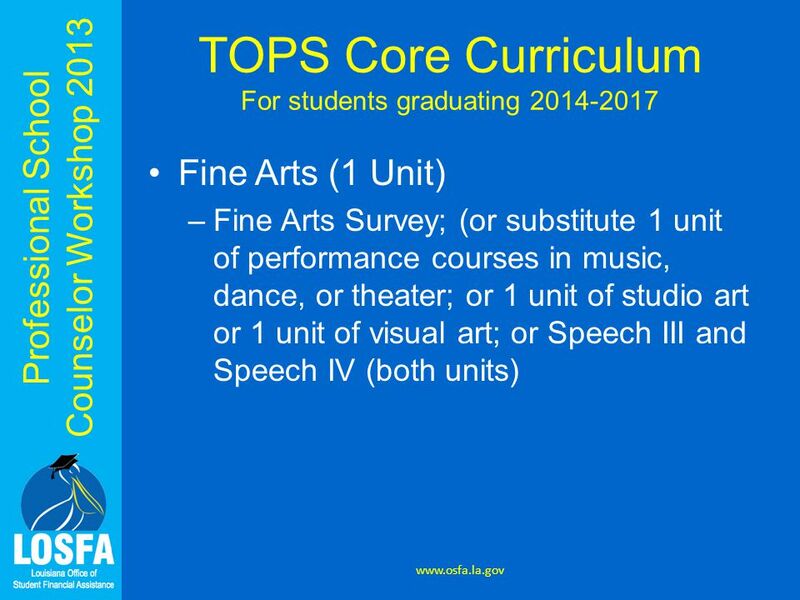 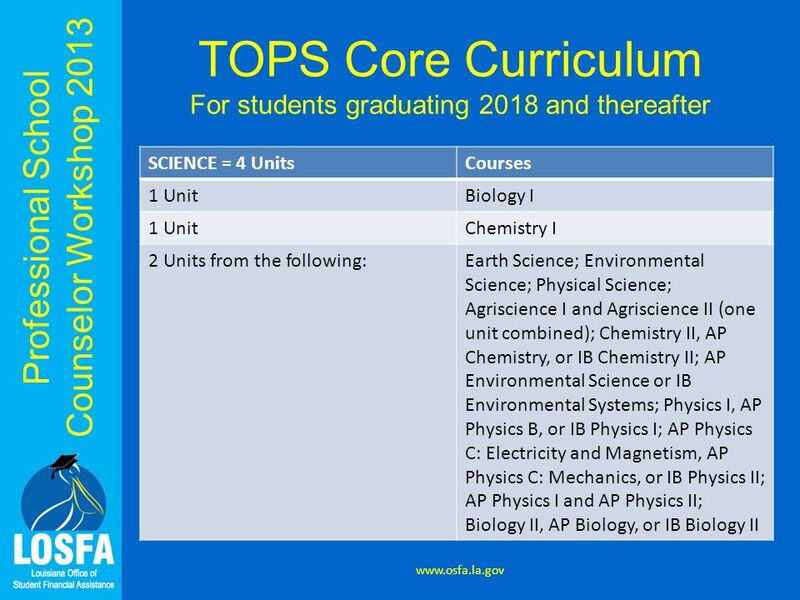 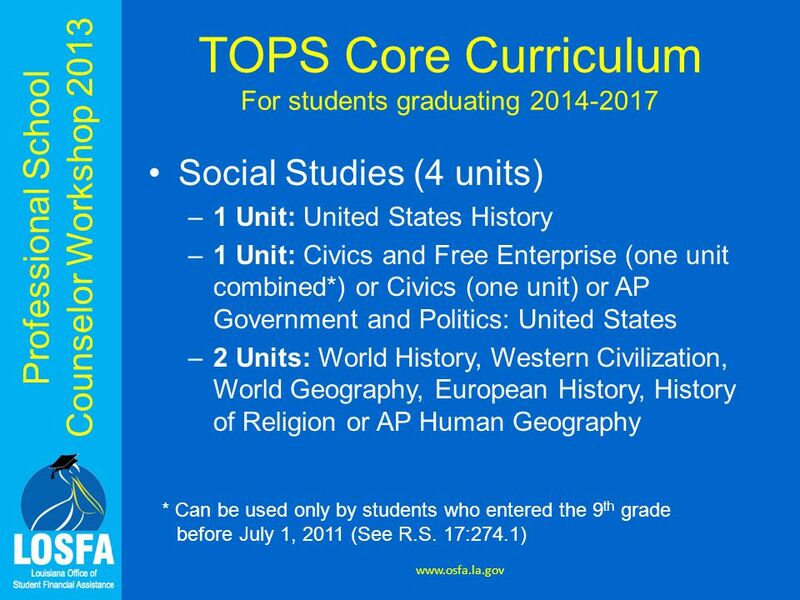 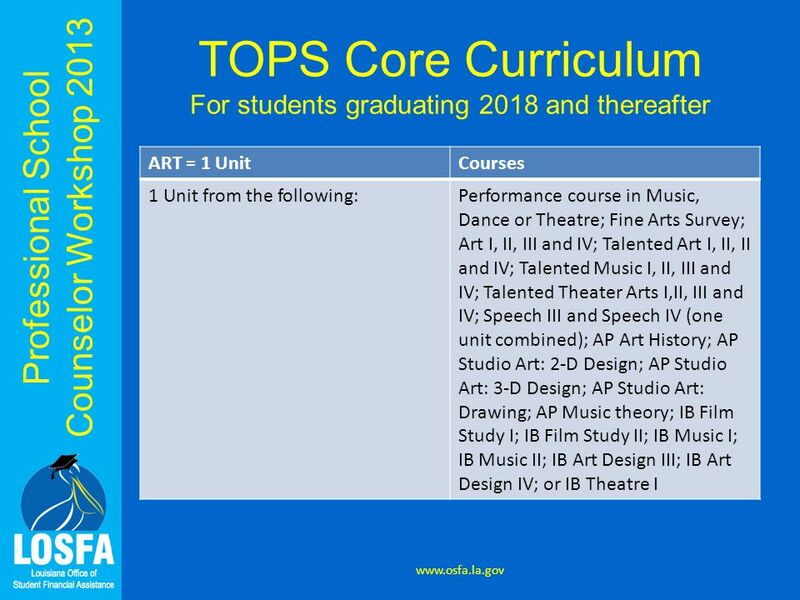 If you are a 2014 high school graduate and your application is received from Aug. 31, 2015 through Oct. 29, 2015, you will be eligible to receive six semesters of TOPS funding beginning with the 2014- 2015 academic year. 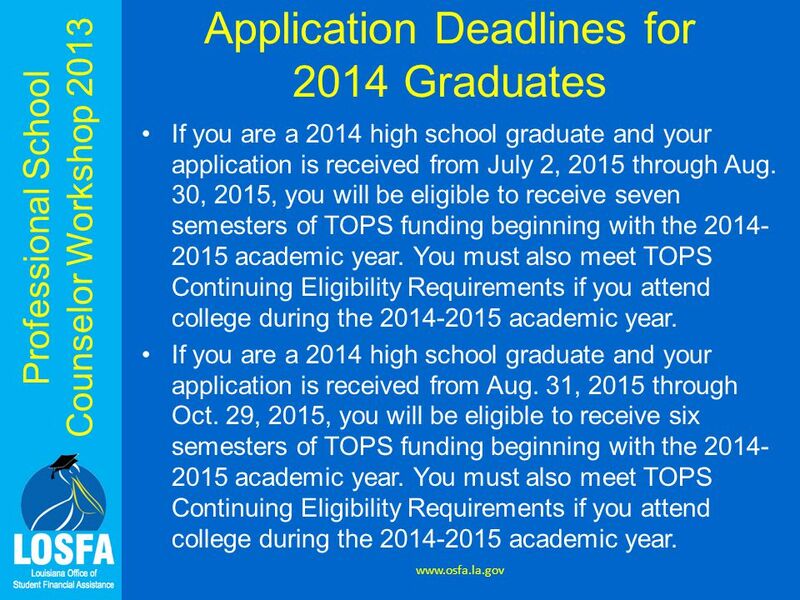 You must also meet TOPS Continuing Eligibility Requirements if you attend college during the 2014-2015 academic year. 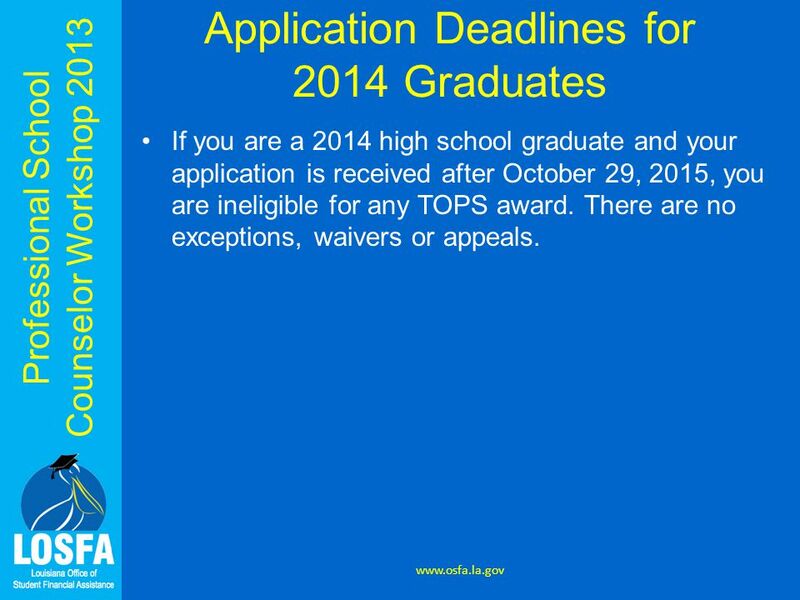 59 Professional School Counselor Workshop 2013 Application Deadlines for 2014 Graduates www.osfa.la.gov If you are a 2014 high school graduate and your application is received after October 29, 2015, you are ineligible for any TOPS award. 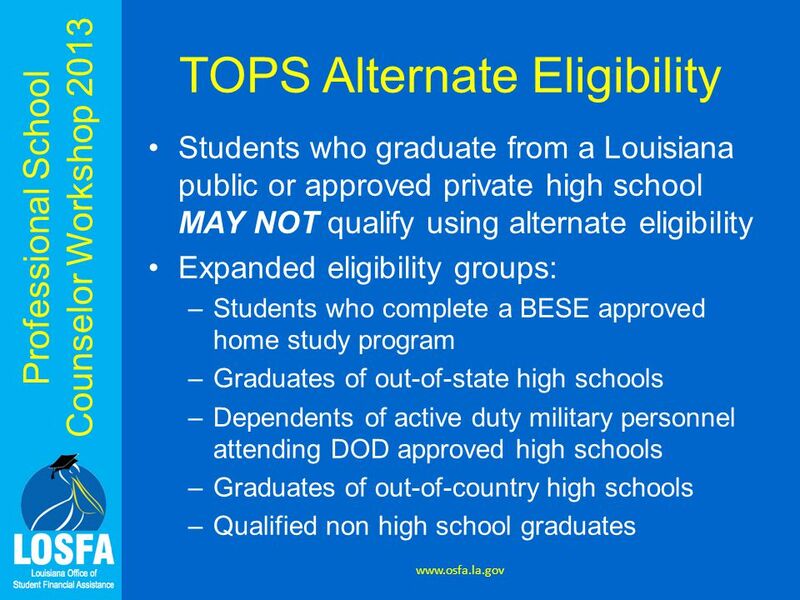 There are no exceptions, waivers or appeals. 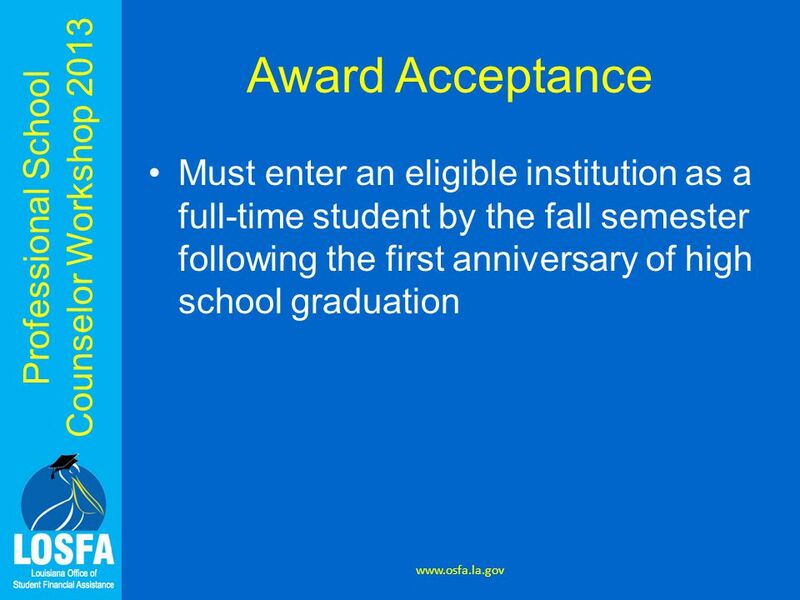 60 Professional School Counselor Workshop 2013 Application Deadlines for 2014 Graduates www.osfa.la.gov Initial Application Receipt DateReceives TOPS funding for: Jan. 1, 2014 – July 1, 20158 semesters (12 quarters) Beginning Fall 2014 July 2, 2015 – Aug. 30, 20157 semesters (10 quarters) Beginning Fall 2014 Aug. 31, 2015 – Oct. 29, 20156 semesters (9 quarters) Beginning Fall 2014 Initial Applications Received After October 29, 2015 Ineligible for TOPS Students who enroll full-time before their initial application is received must also have met the TOPS Continuing Eligibility Requirements to be eligible for TOPS funding for semesters, quarters or terms after the semester of first-time, full-time enrollment. 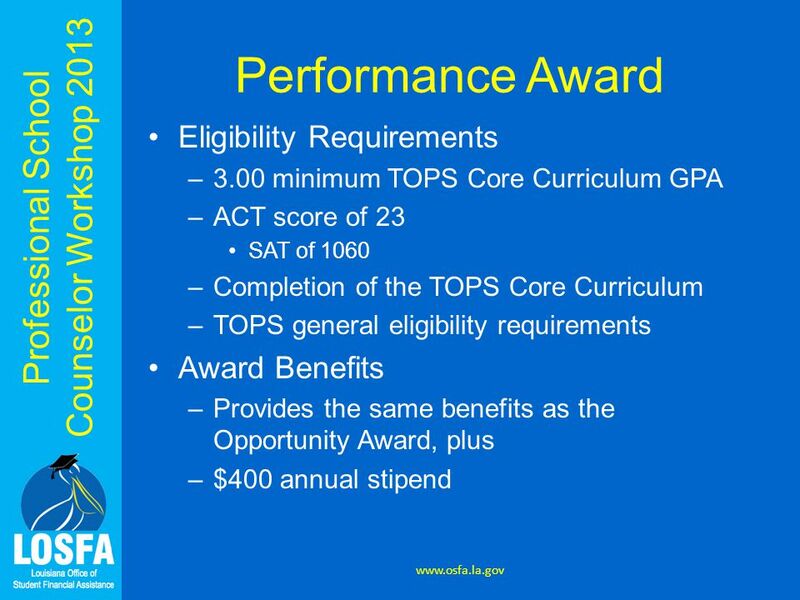 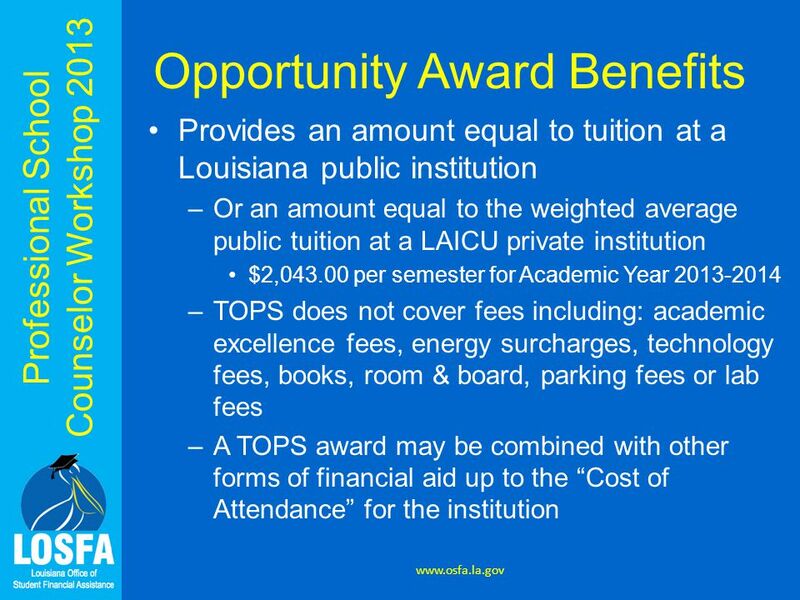 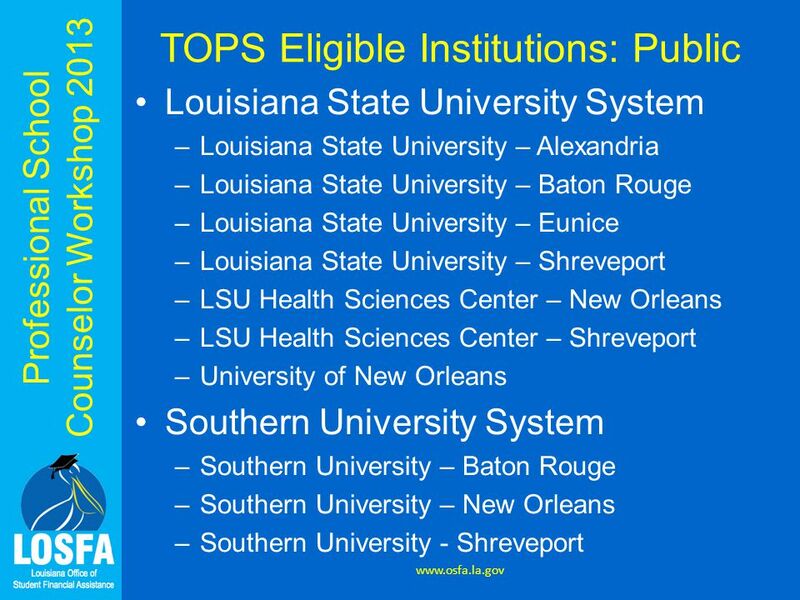 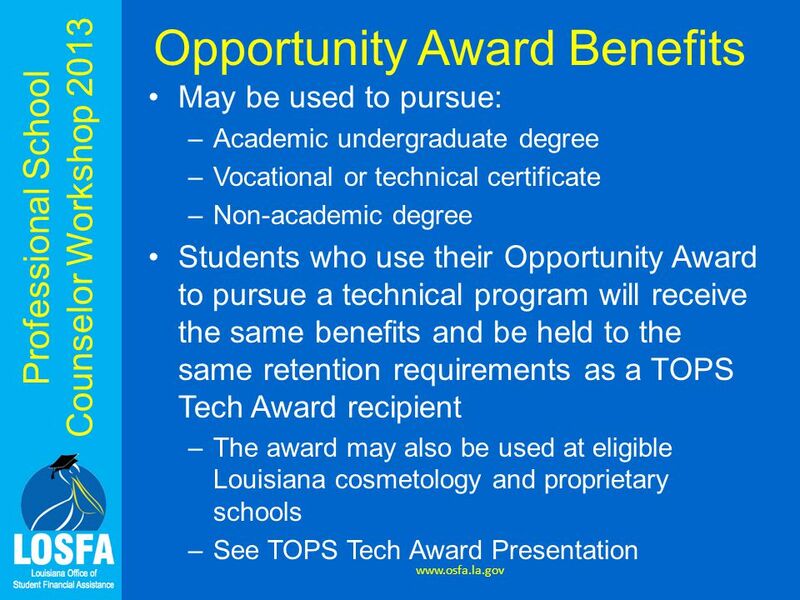 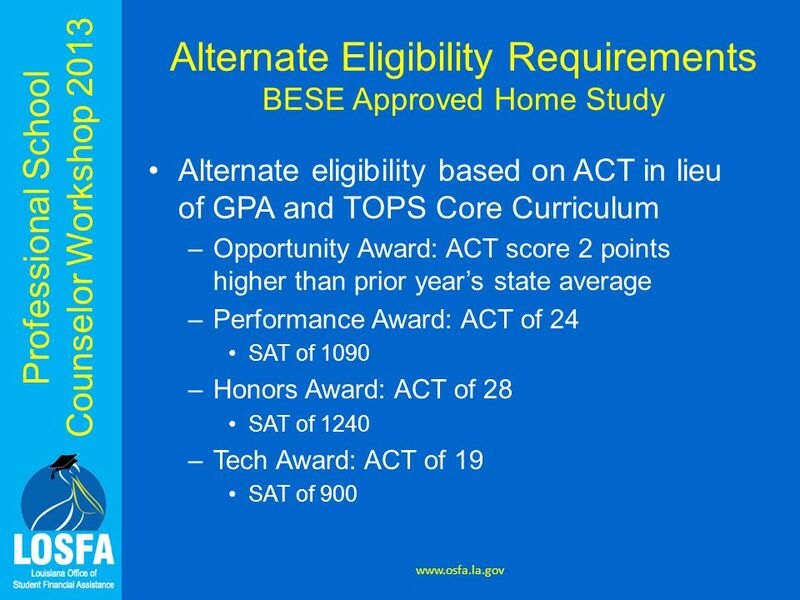 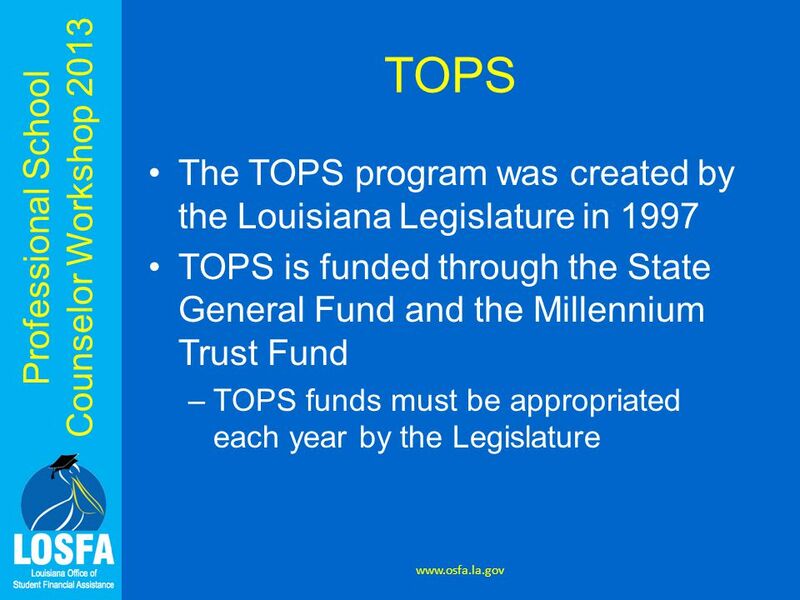 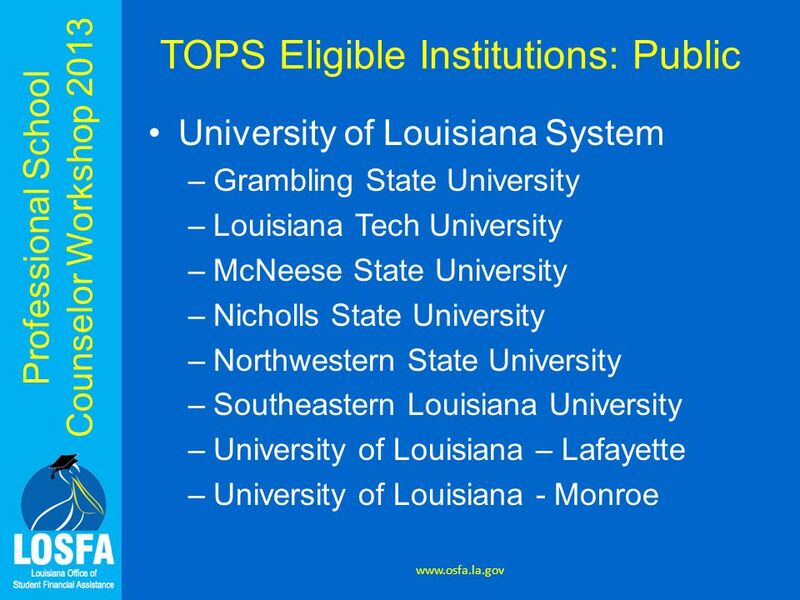 Download ppt "Louisiana’s First Choice for College Access TOPS Opportunity, Performance and Honors Awards." 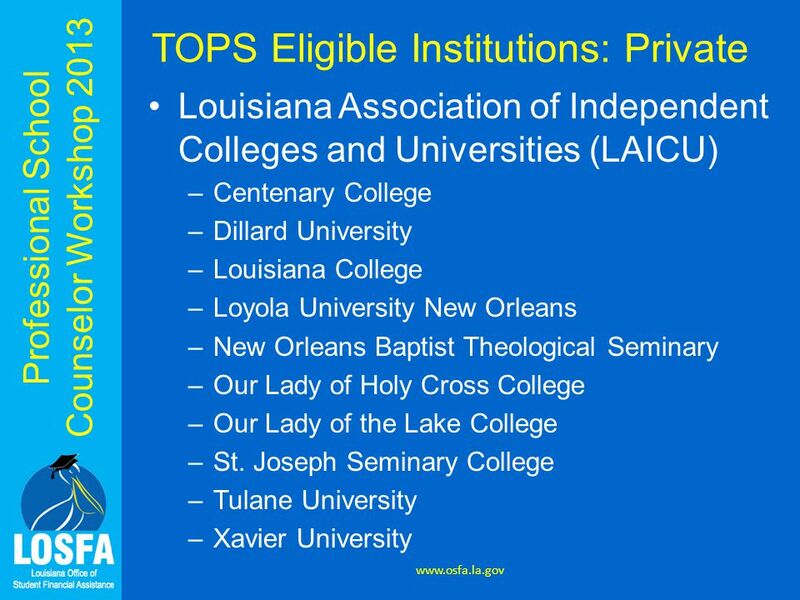 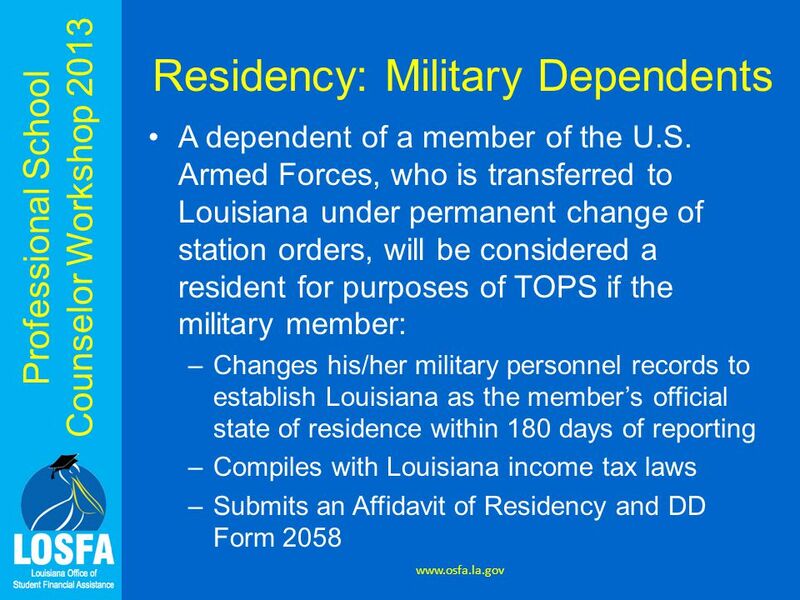 Louisianas First Choice for College Access. 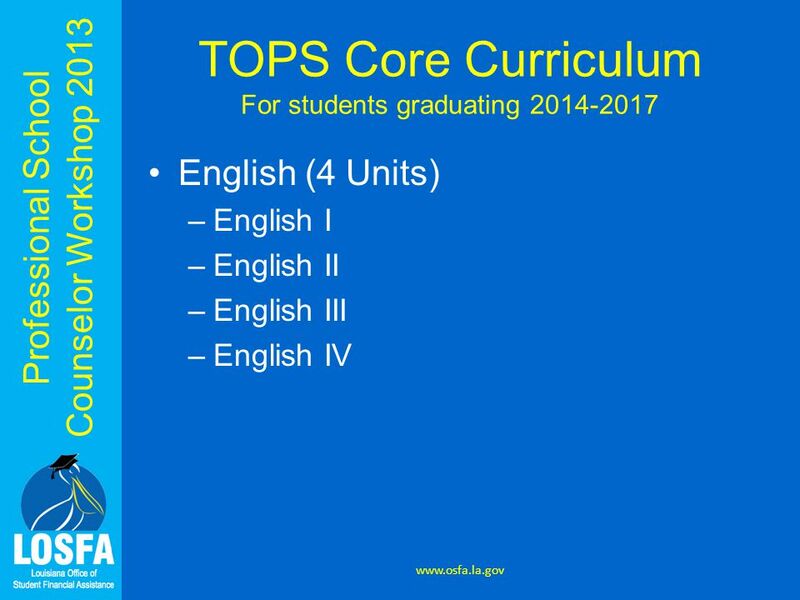 Professional School Counselor Workshop Welcome! 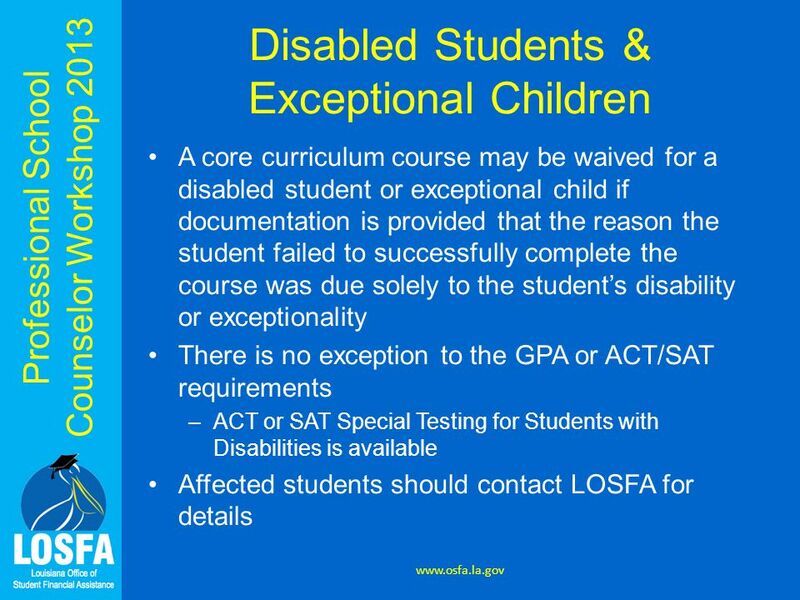 LOSFA Professional School Counselor Workshop. 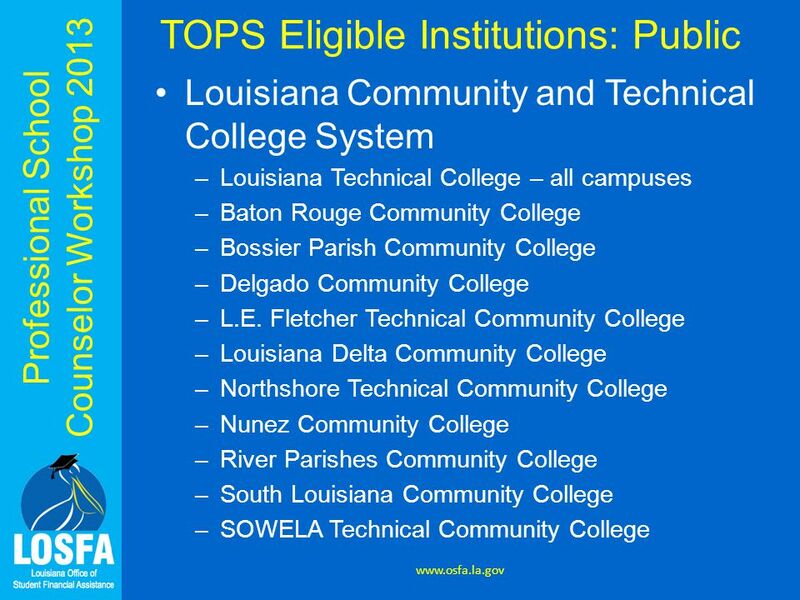 Louisiana’s First Choice for College Access. 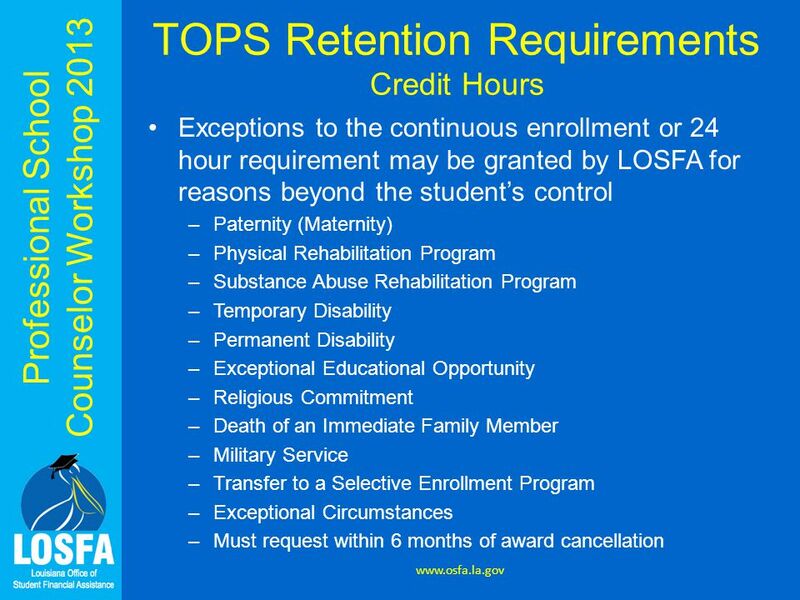 LOSFA Administered Programs TOPS START Saving Program TOPS Tech Early Start Program Chafee Educational Training. 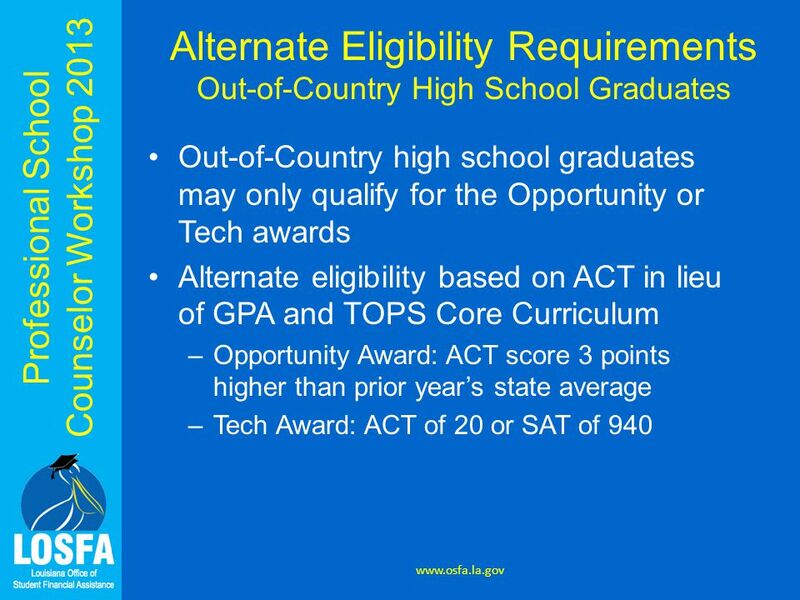 Cherokee High School 4 Year Plans. 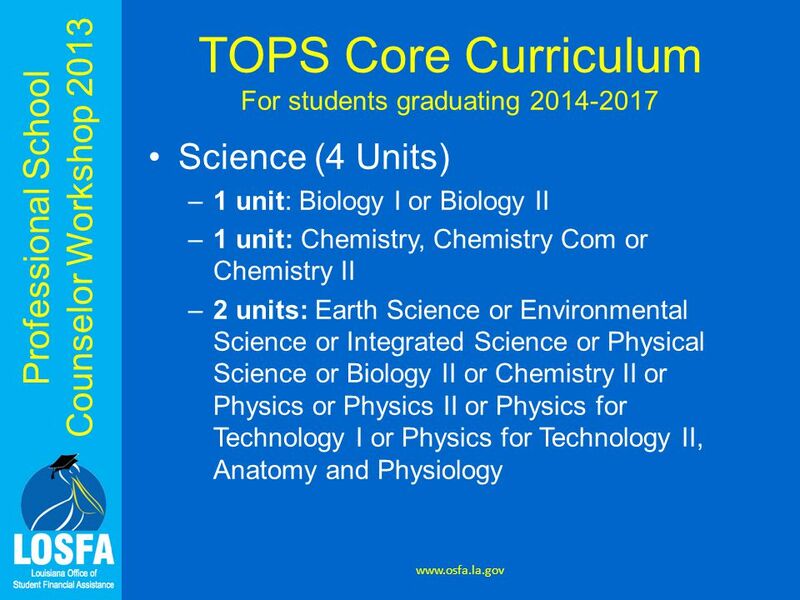 What is a unit, and how can I earn one? 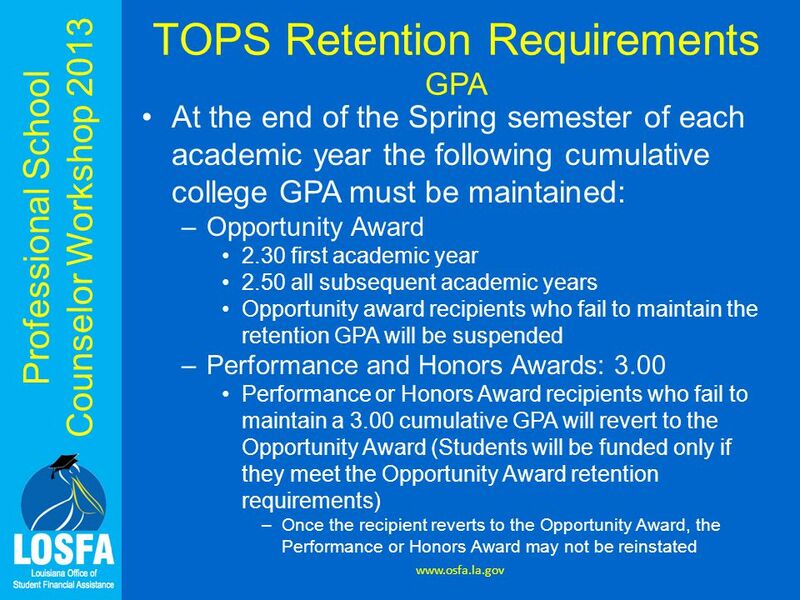 23 Units REQUIRED for graduation Units are earned in 0.5 unit increments per. 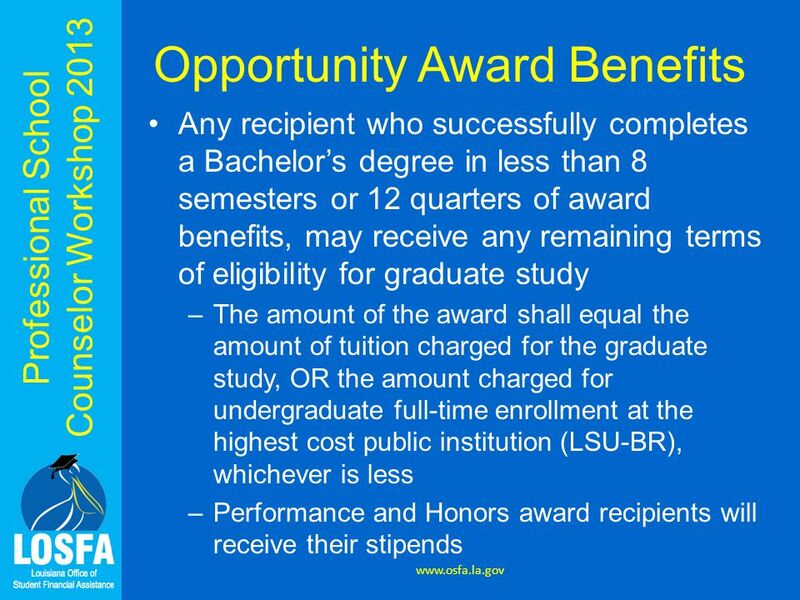 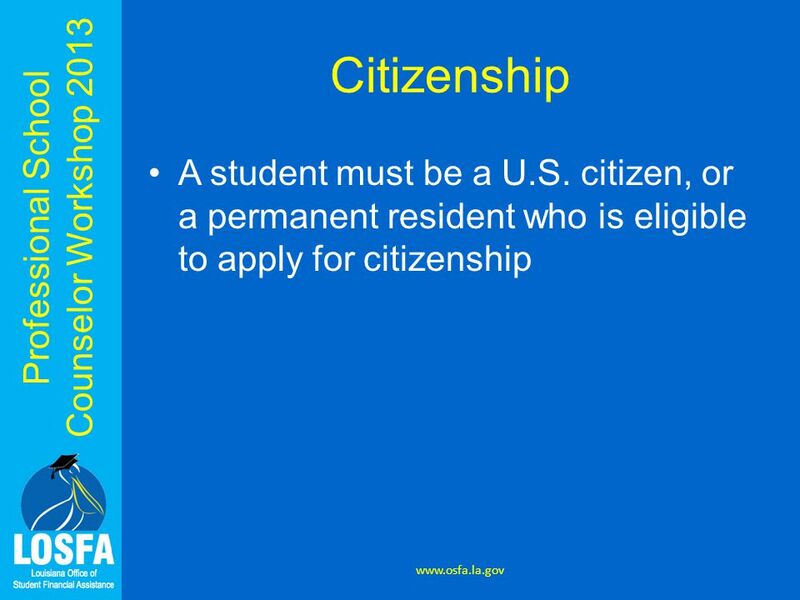 Cal Grants and the California Dream Act of 2011 Presented by the California Student Aid Commission 1. 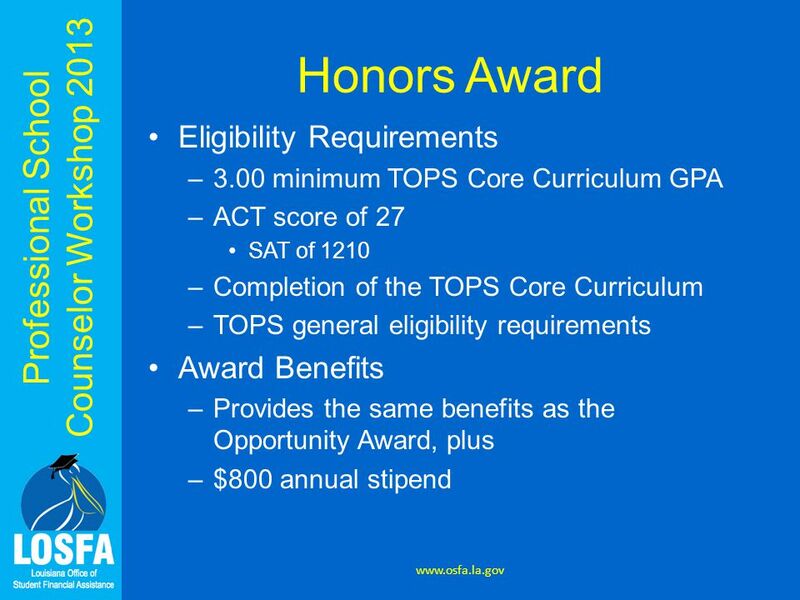 Florida Department of Education Office of Student Financial Assistance (OSFA) Florida Department of Education Office of Student Financial Assistance. 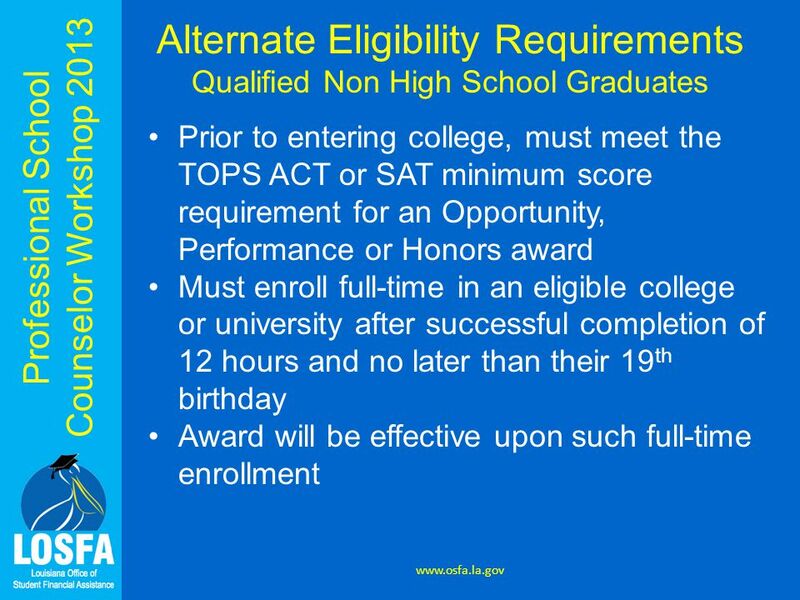 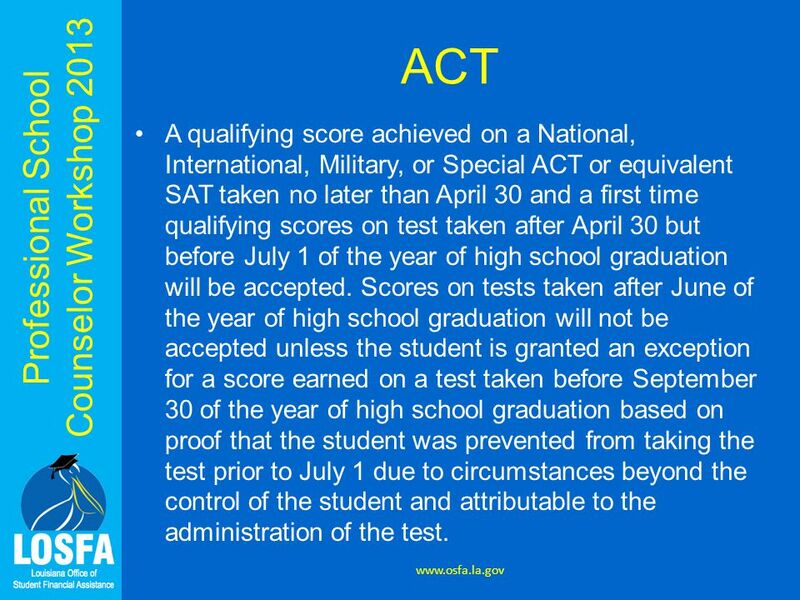 College Credit Now (Dual Enrollment) Information And Procedures * Subject to change based on legislative action. 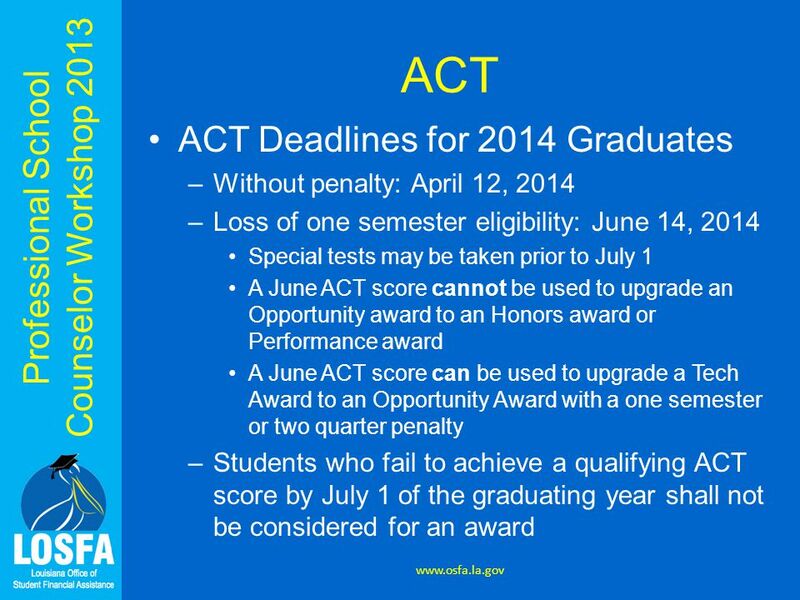 Your Path to the Student-Athlete Experience NCAA Eligibility Center Expires September 1, 2014. 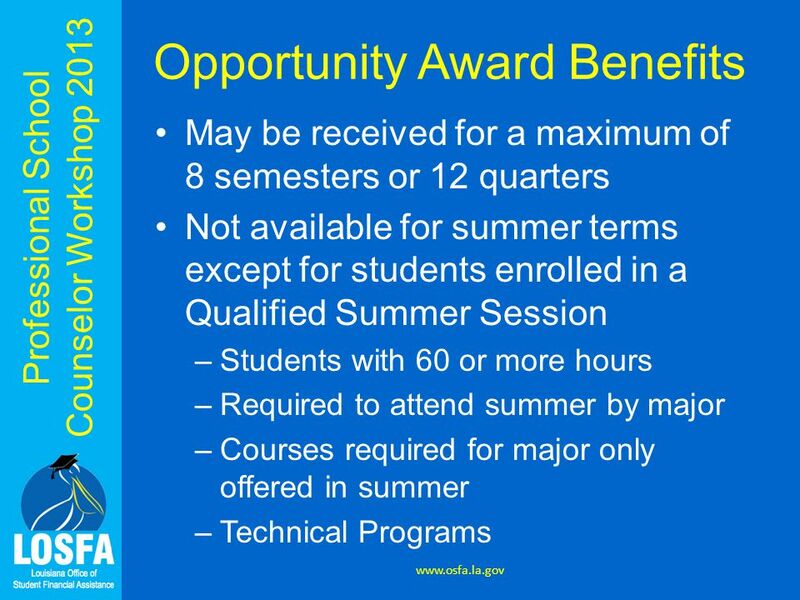 Interested in becoming a M2O student? 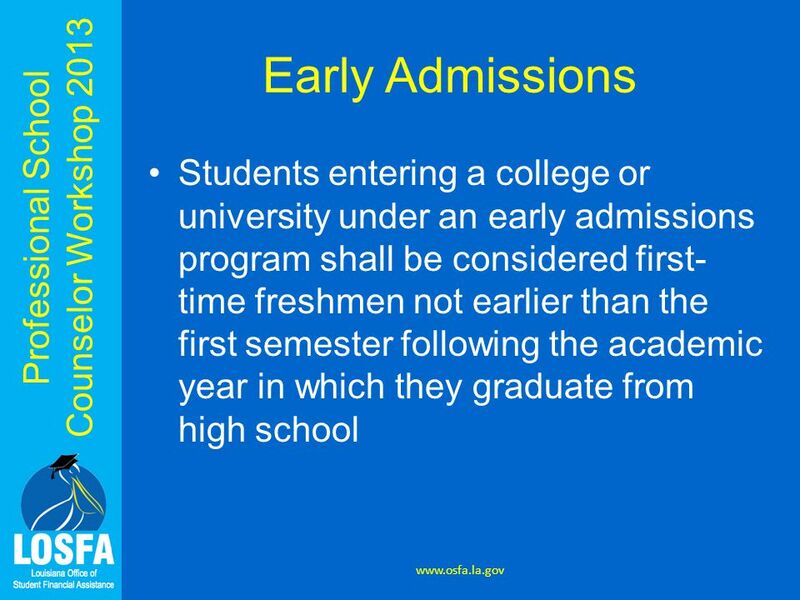 This information session will offer you the opportunity to explore the benefits of the Concurrent Enrollment program. 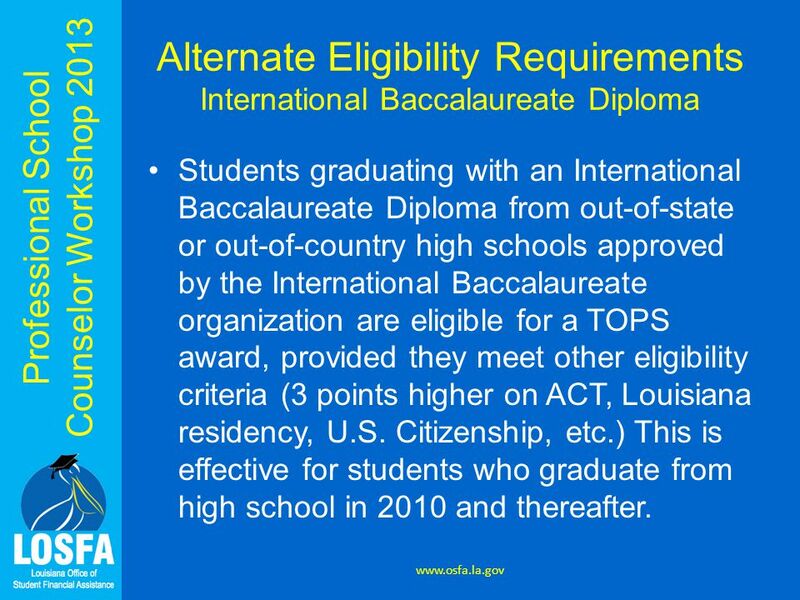 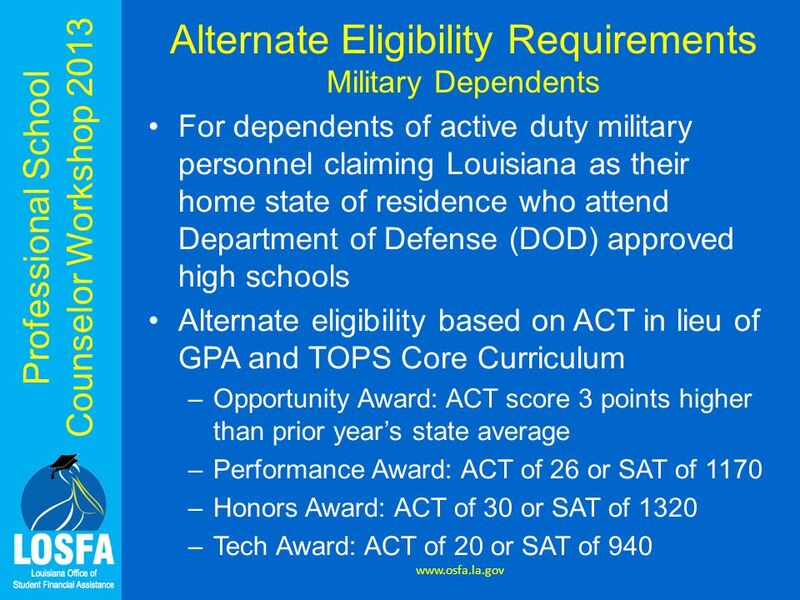 NCAA Initial-Eligibility Requirements B ULLDOGGER A THLETIC D EPARTMENT dd 2/2014. 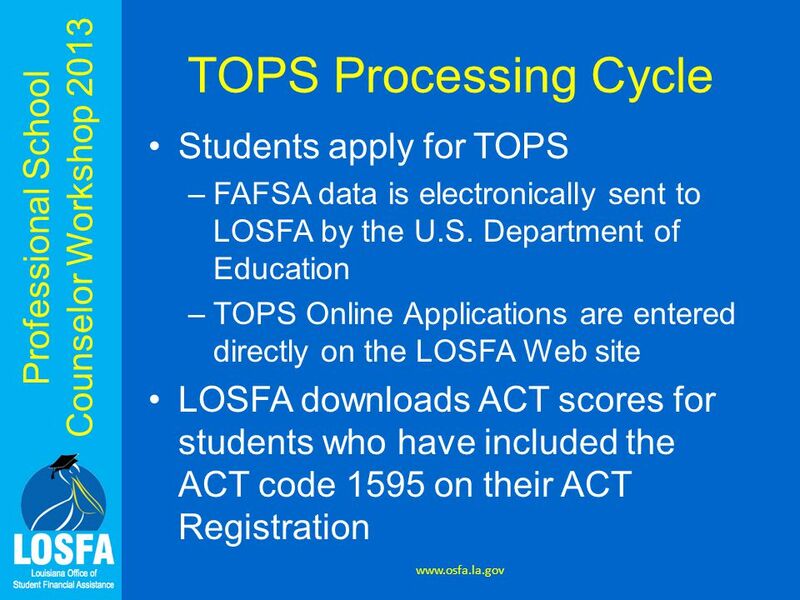 Welcome to Financial Aid Night An overview of financial aid and the application process. 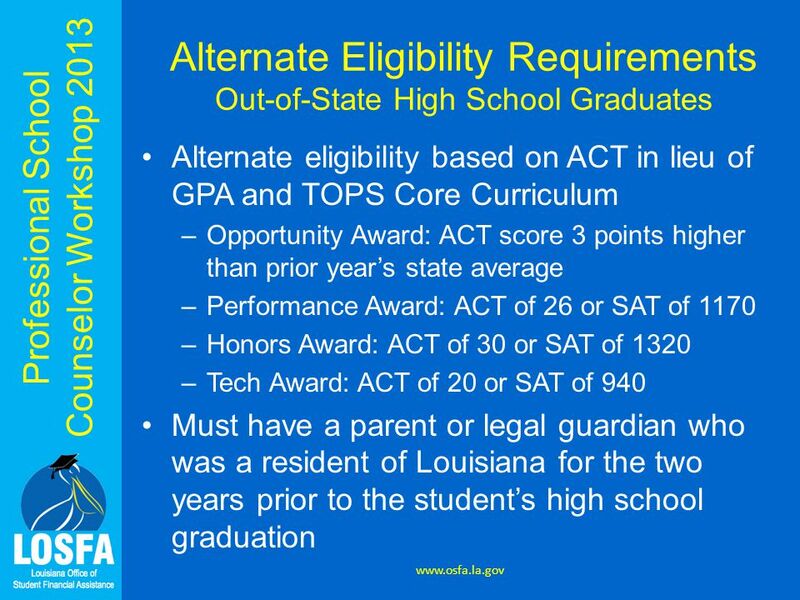 Presented by the Ascension Parish Career Coaches.